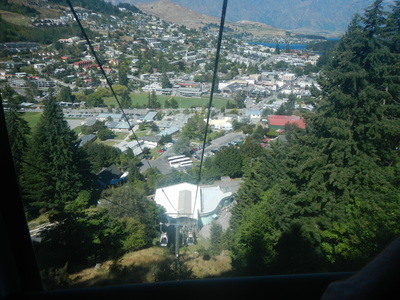 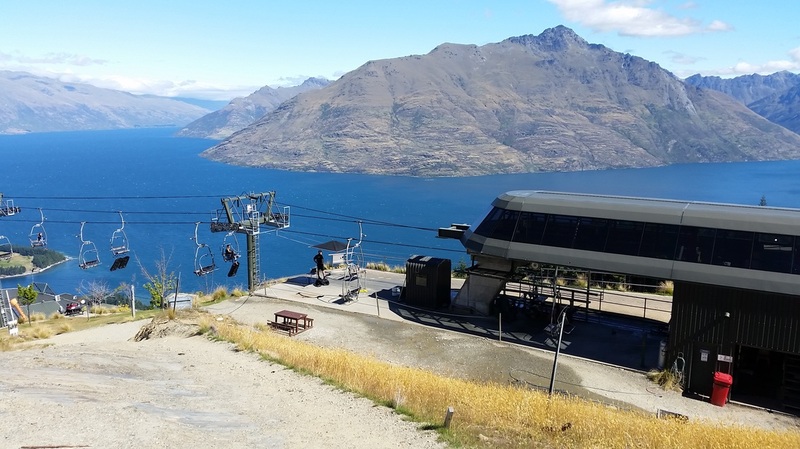 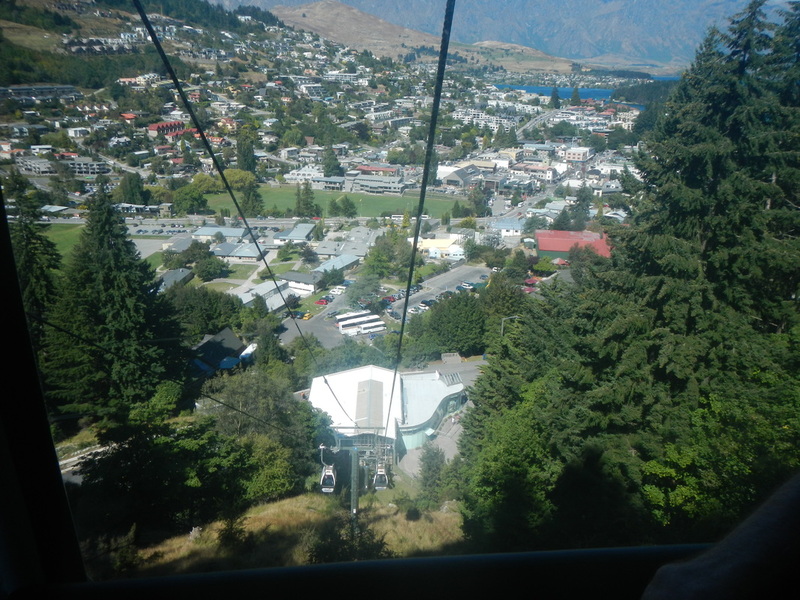 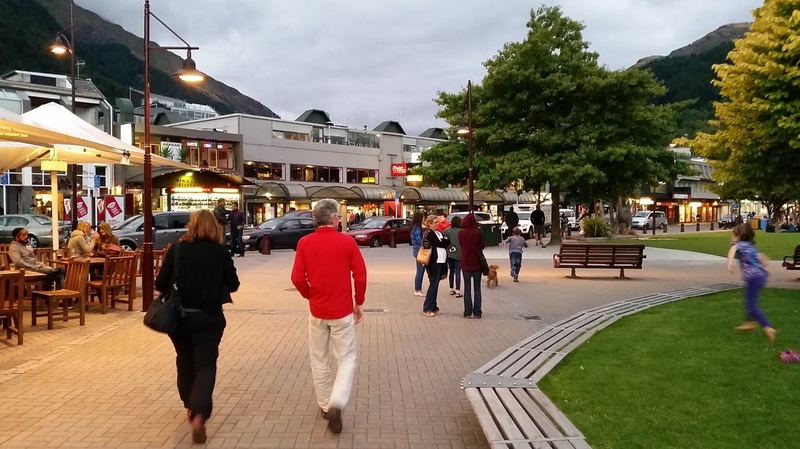 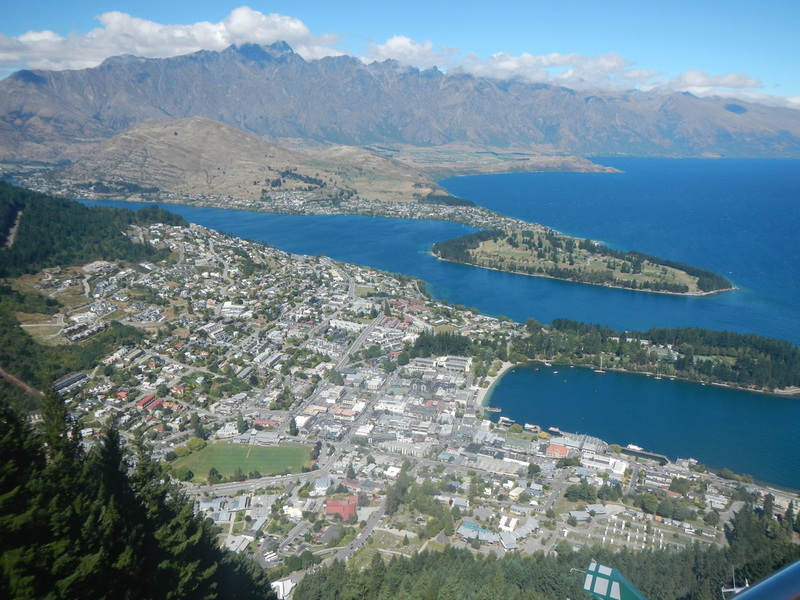 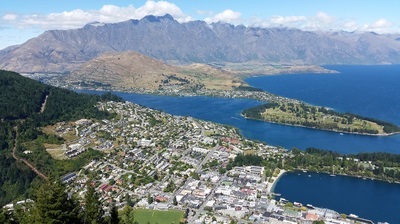 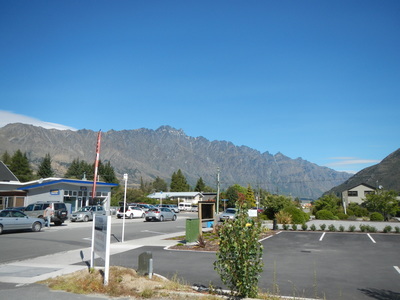 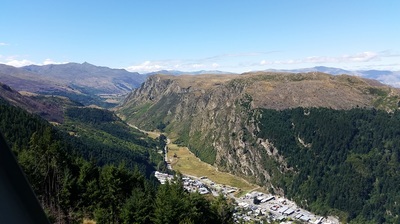 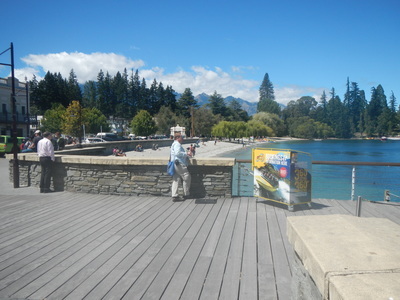 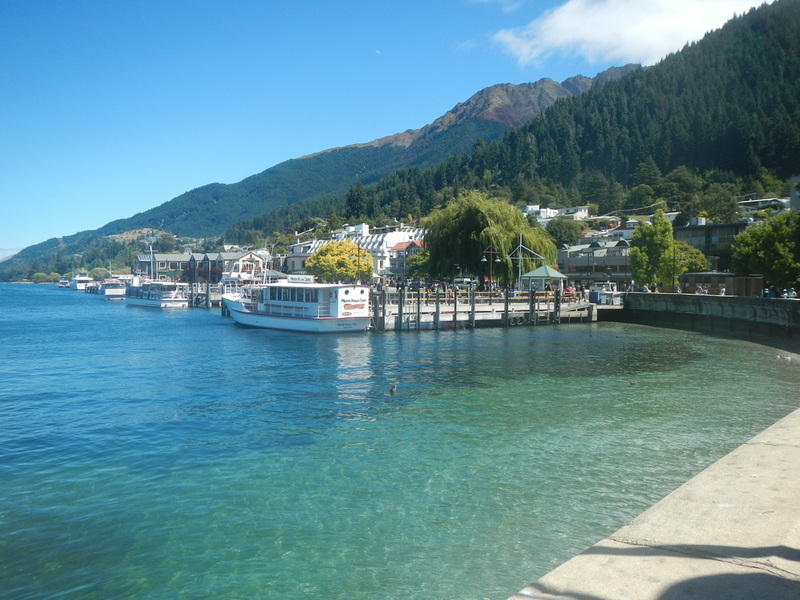 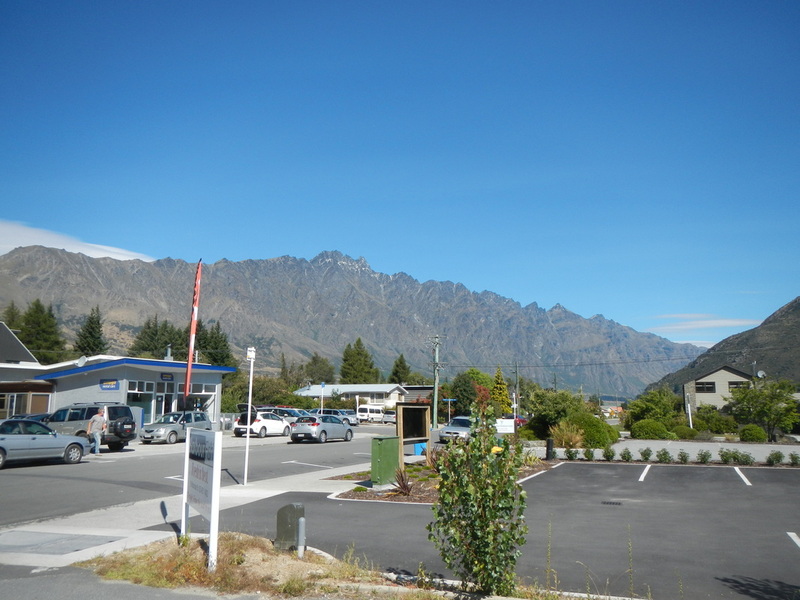 We flew over to Queenstown and then was met by the car hire people. 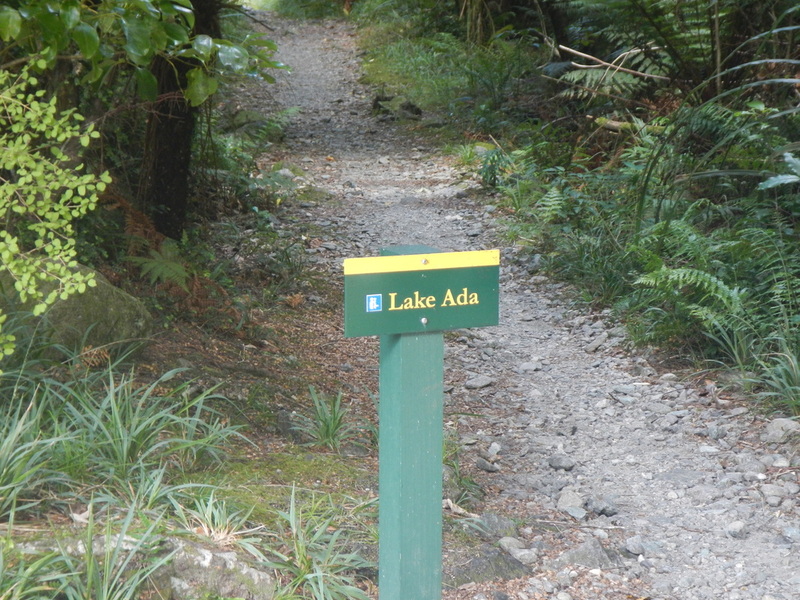 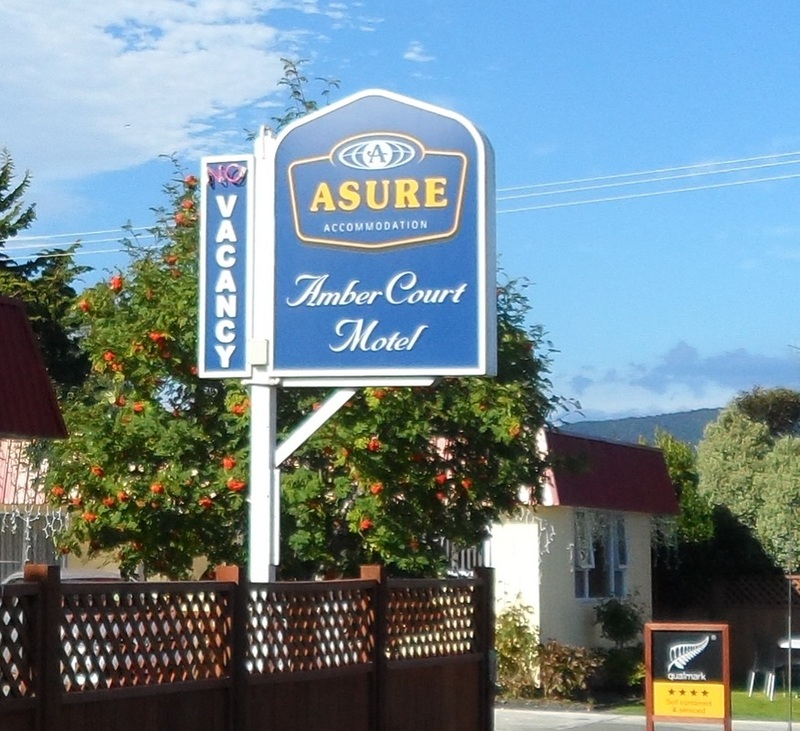 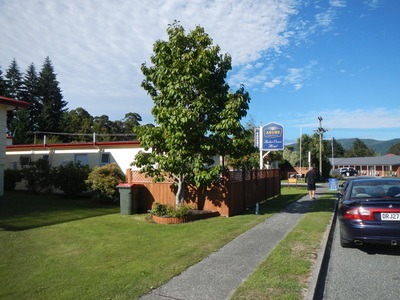 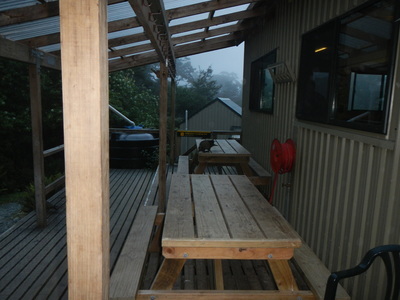 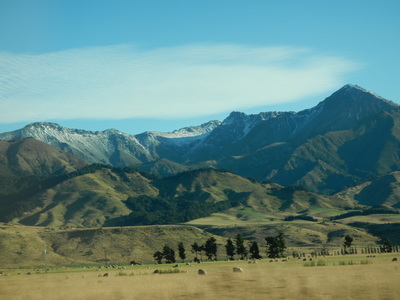 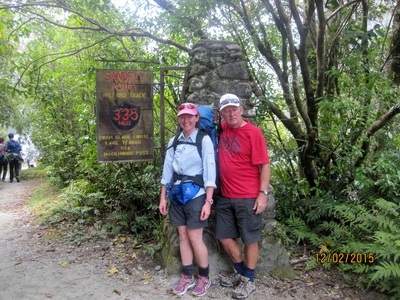 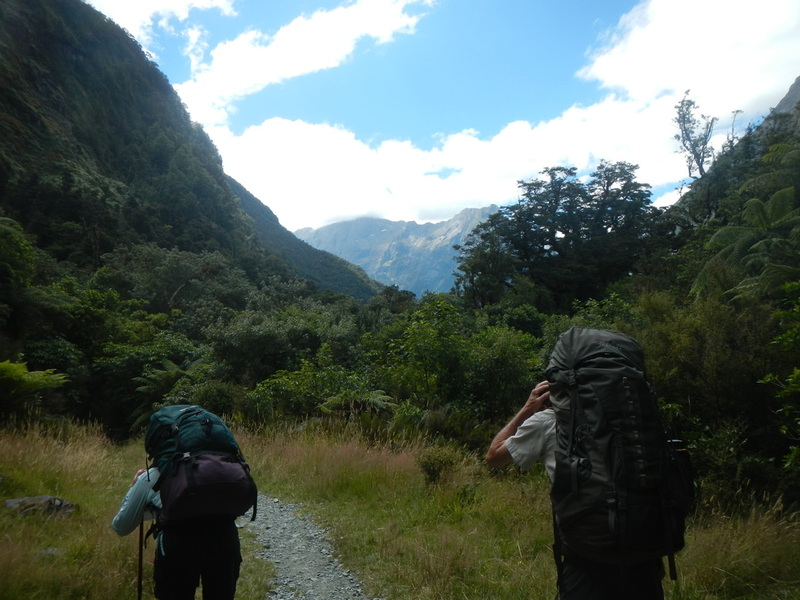 We were soon on the road to Te Anu and our lodgings. It was a great drive down to witness the mountains we had flown over and now from the ground. 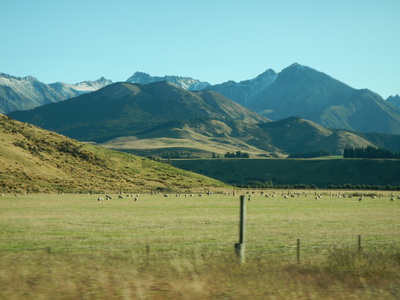 It was also great to see the legendary sheep population and so much green grass. Otherwise the trip was pretty uneventful. 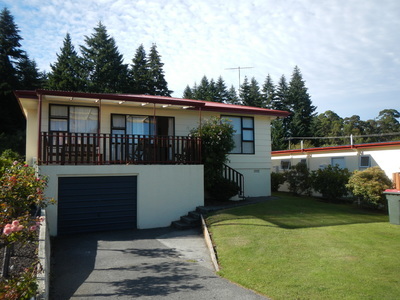 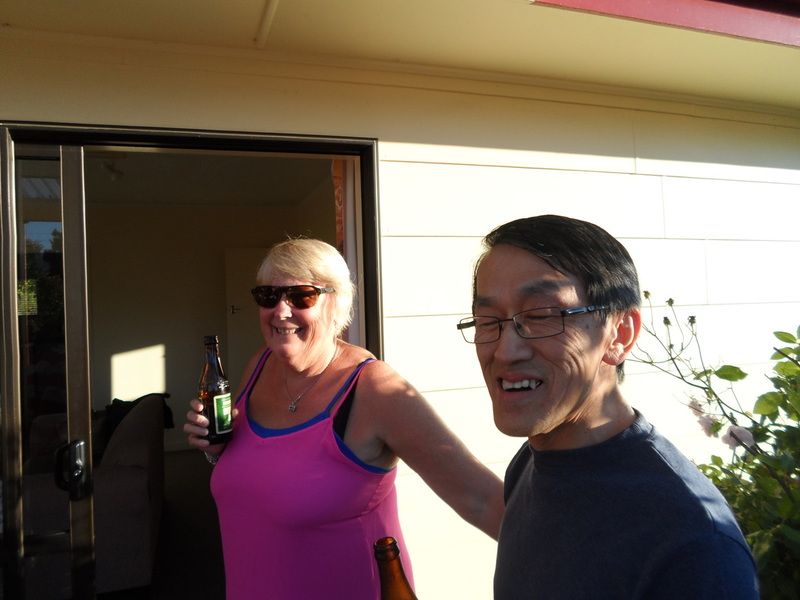 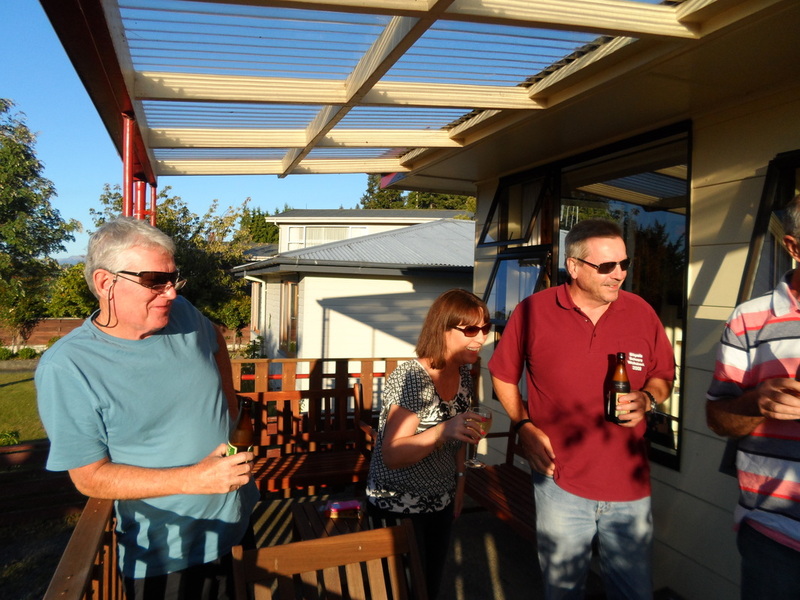 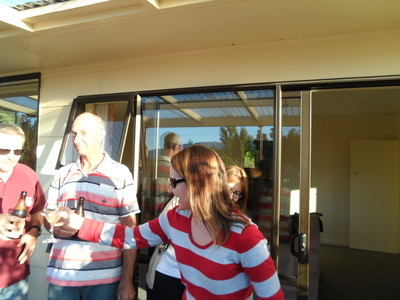 At the rental houses, Marilyn was already there and had cold beer, wine and food for our arrival. 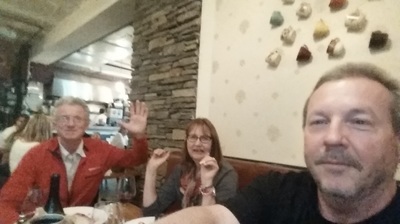 We also had a big dinner that night and Jason (who is not a big drinker) was introduced (by the ladies) to gin and tonic. 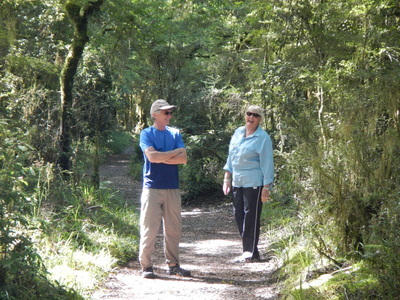 It certainly sparked a very lively conversation. 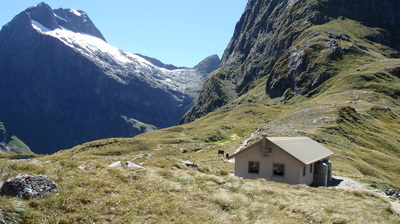 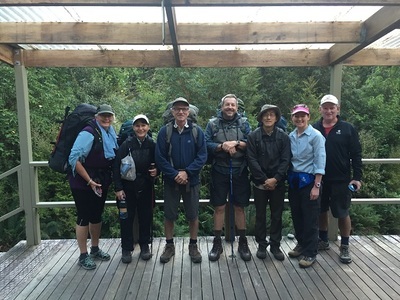 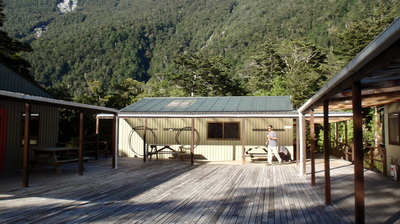 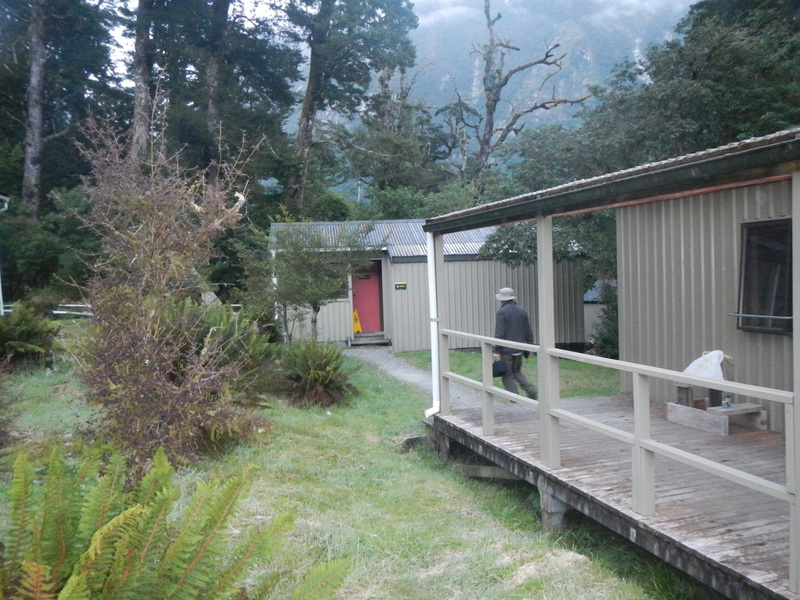 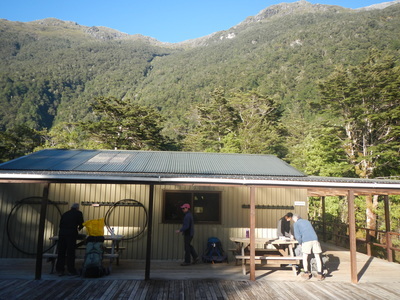 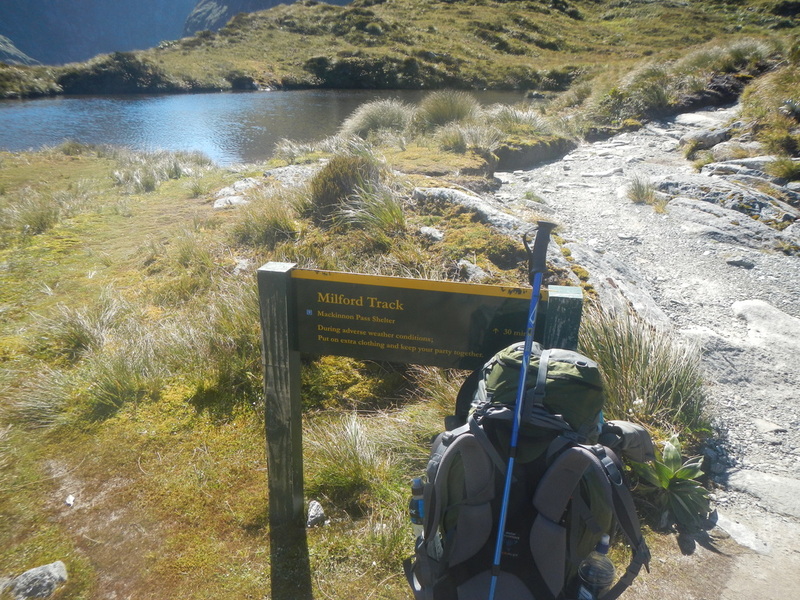 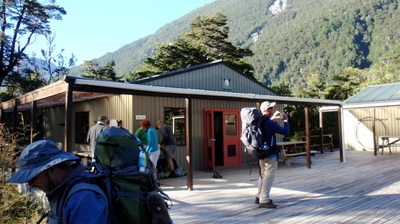 Day 1 - The boat and walk to Clinton hut. We woke to a cloud free sky and 3 degrees. The scattered showers on the previous day had all but disappeared. 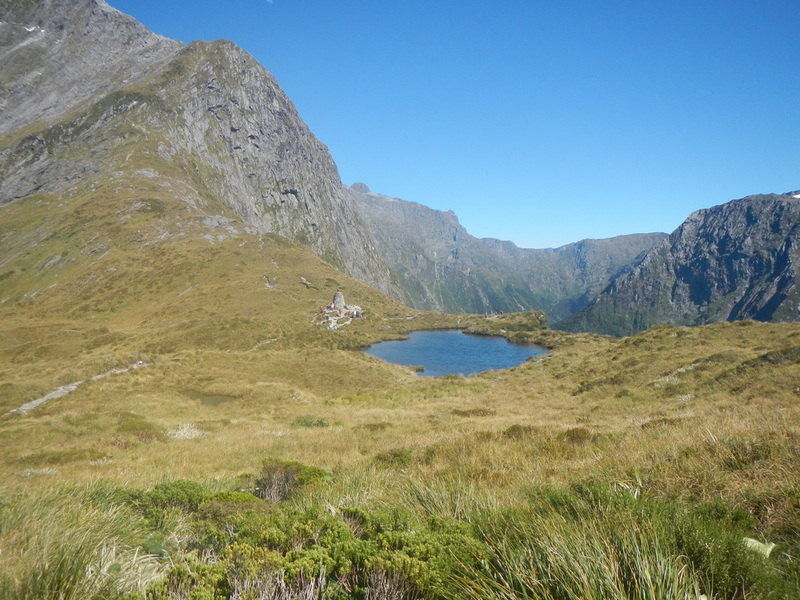 It was a cracker of a day and the walk up the valley was outstanding. We are starting to get that close feeling with the snow capped mountains as we start to climb. 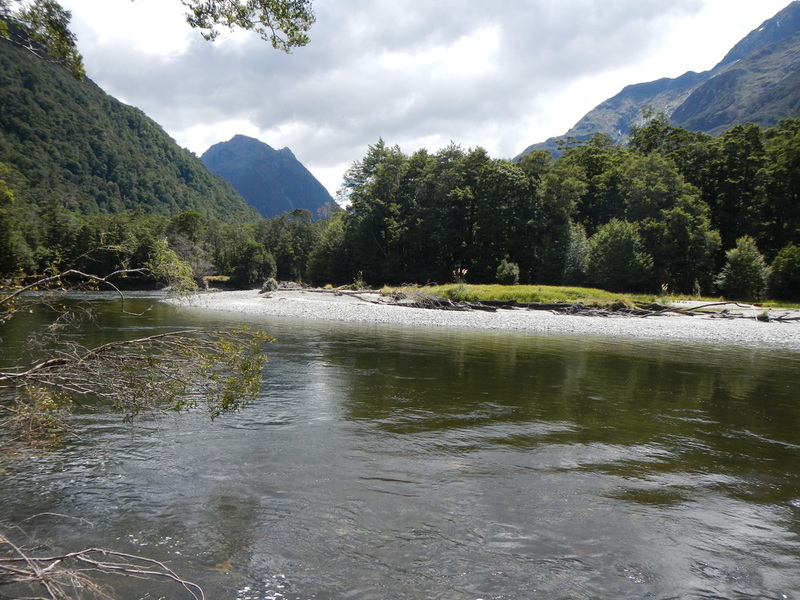 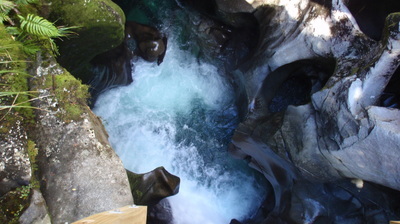 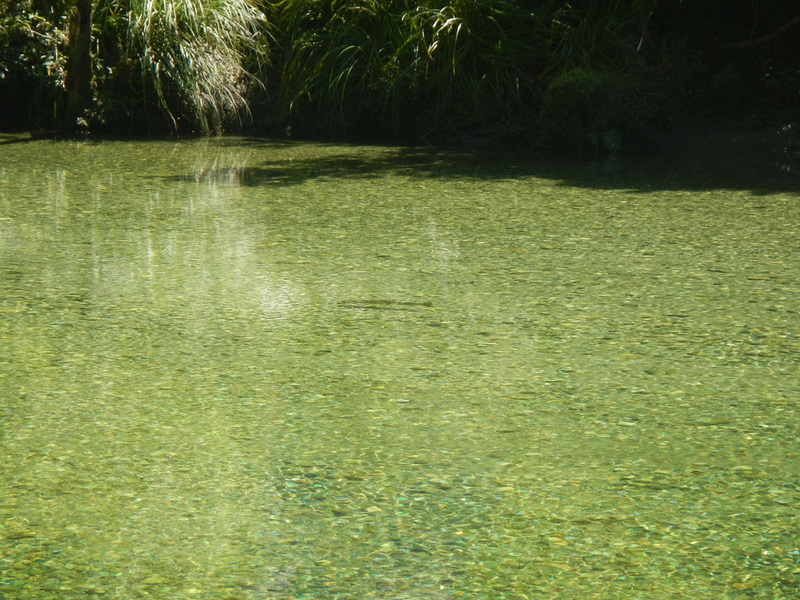 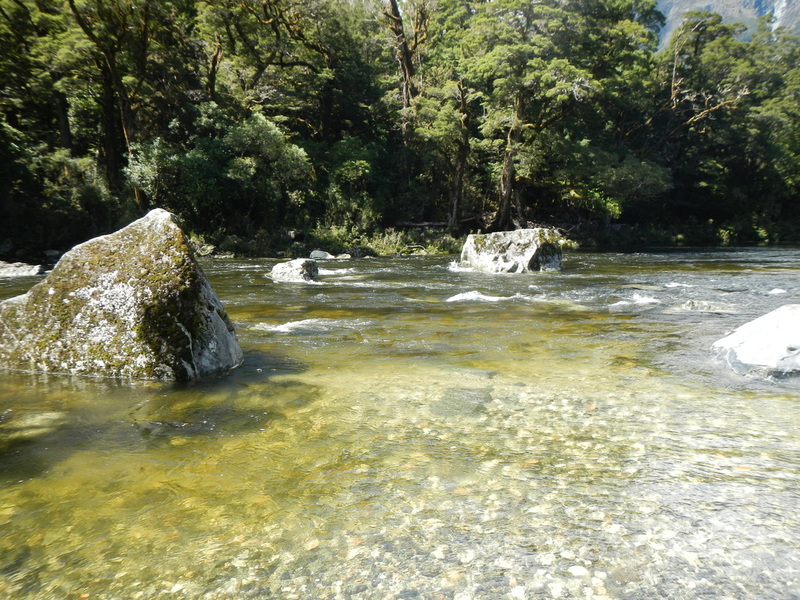 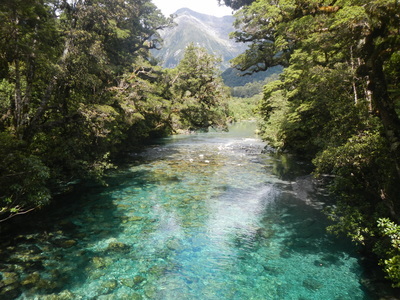 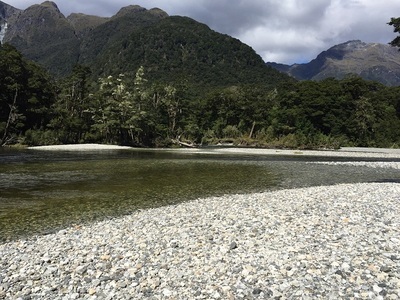 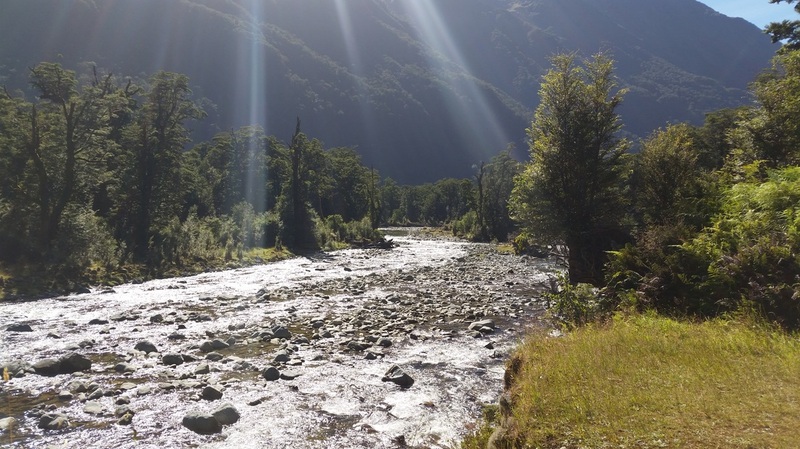 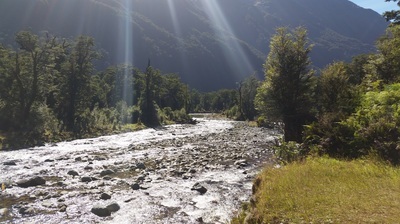 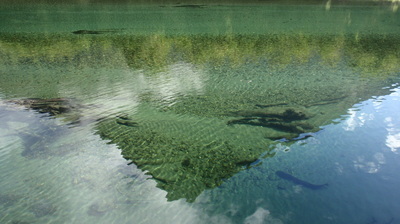 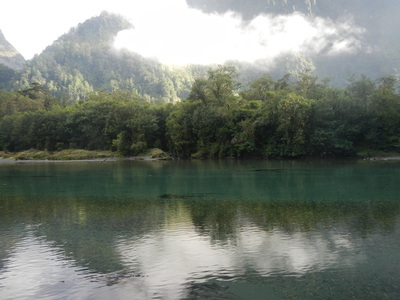 The rivers also are fast, rocky and clear, but every so often they will spill out into a wide shallow bed where trout swim lazily without a seeming care. 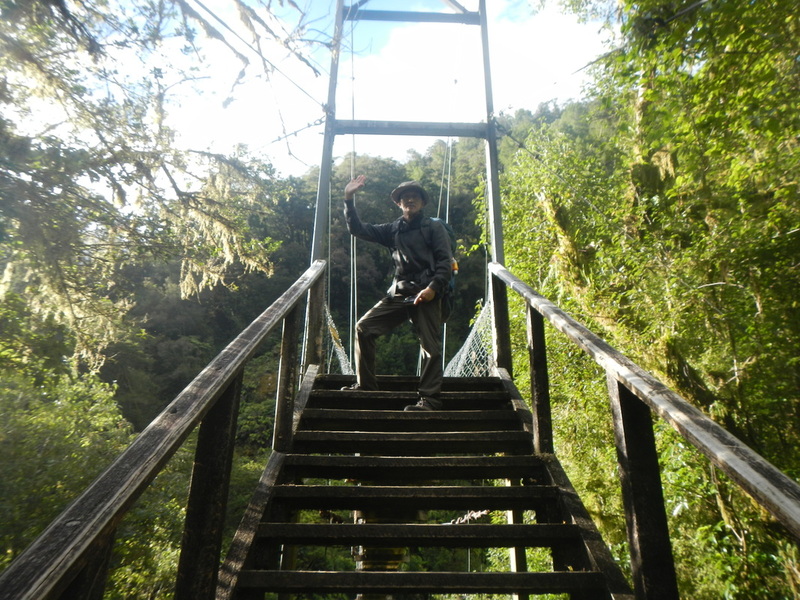 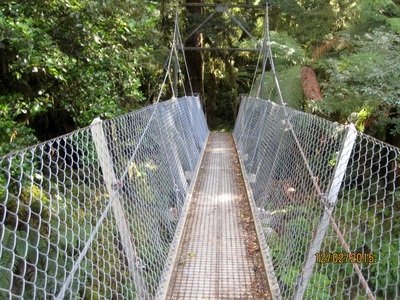 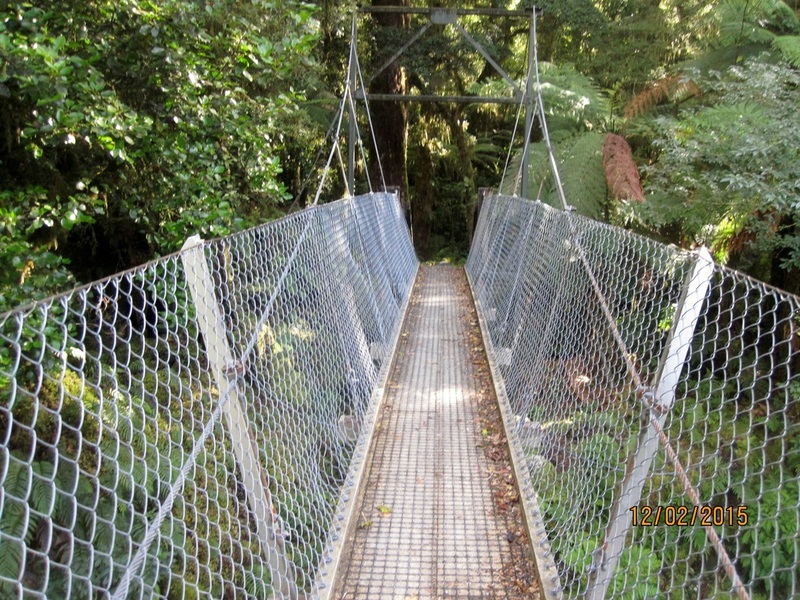 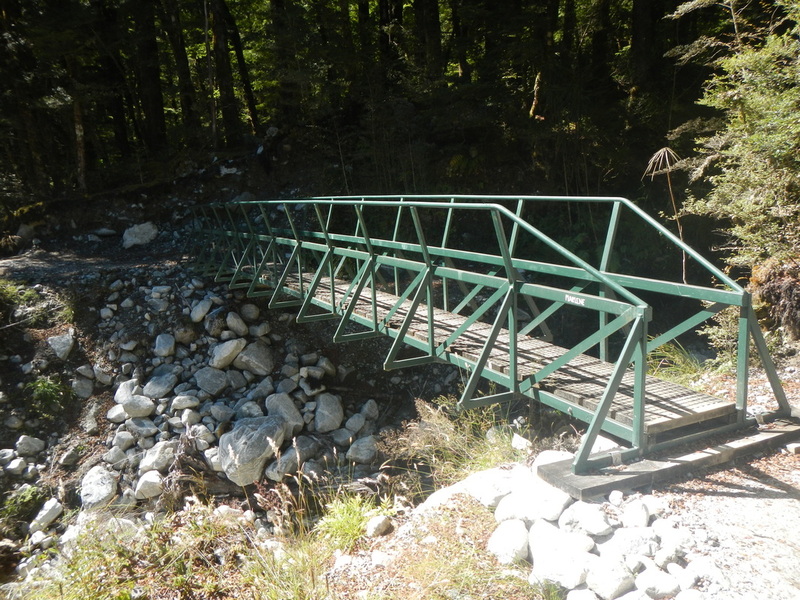 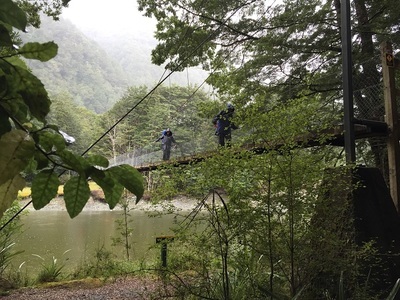 We also now come across the temporary bridges that DOC drop and remove each season for the walkers. 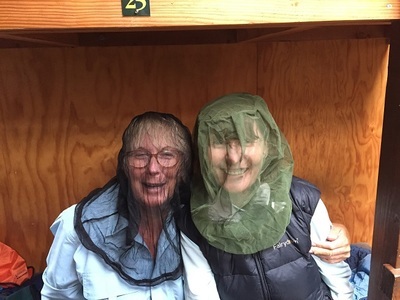 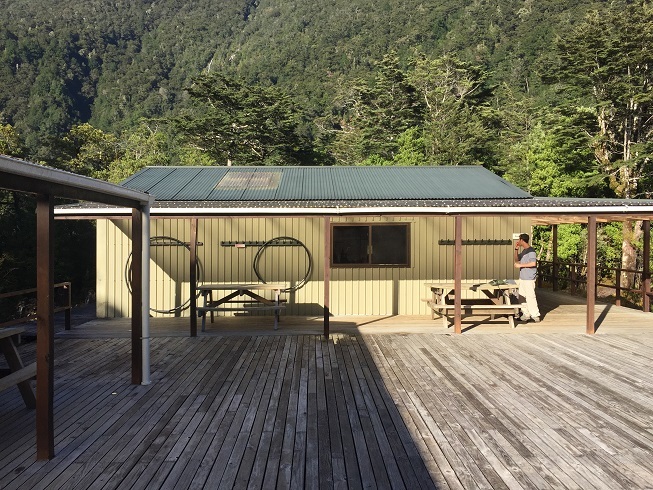 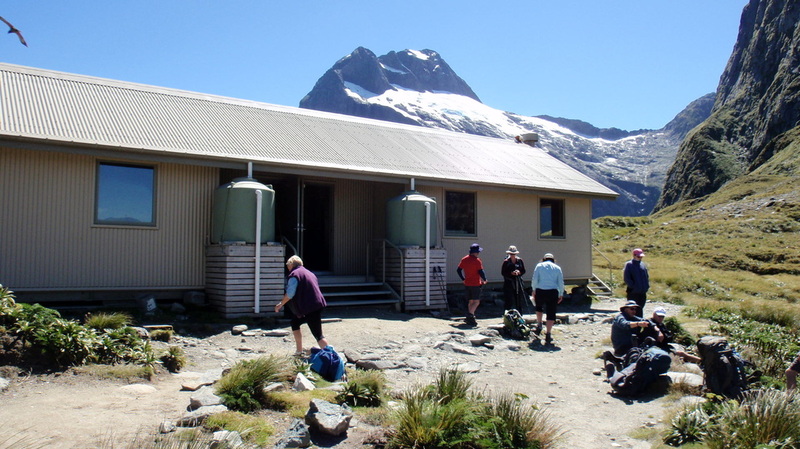 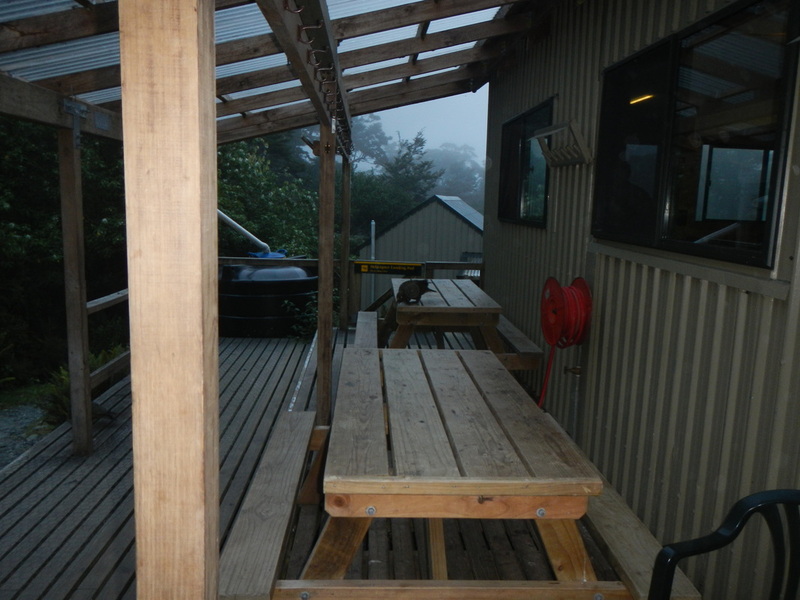 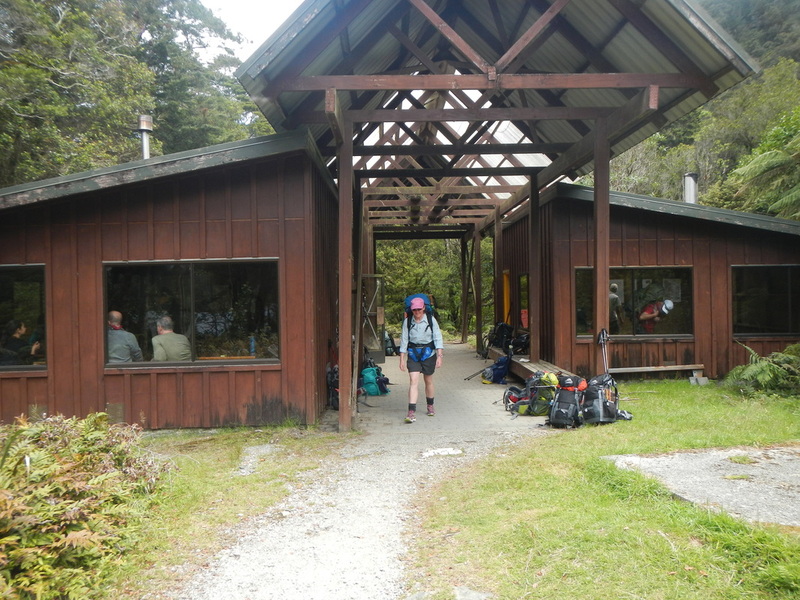 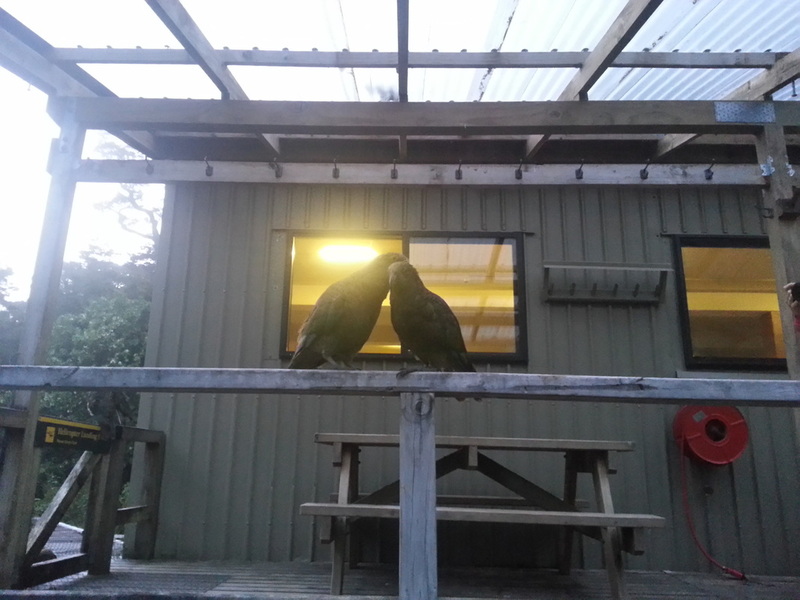 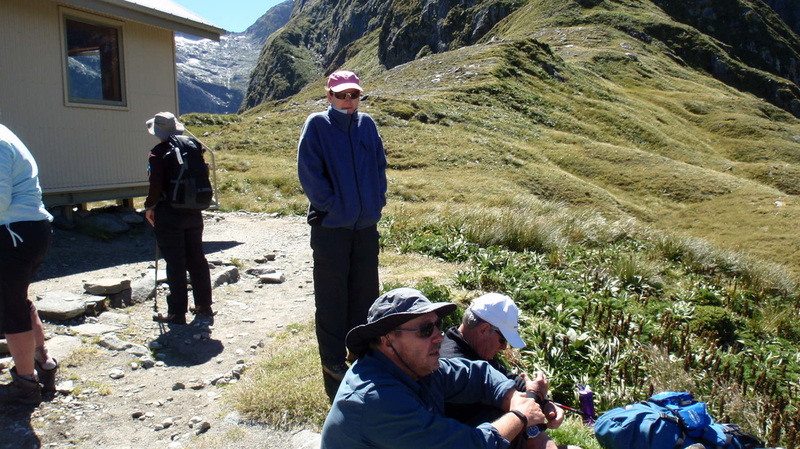 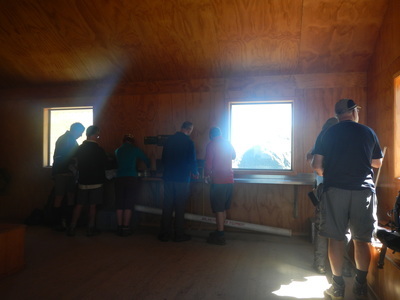 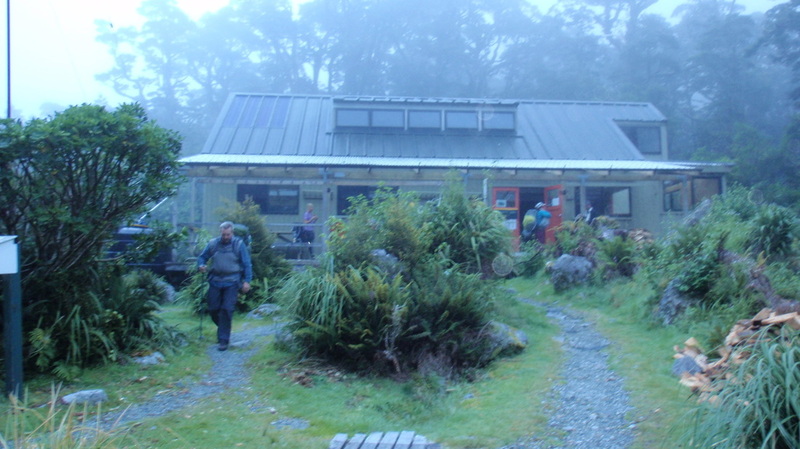 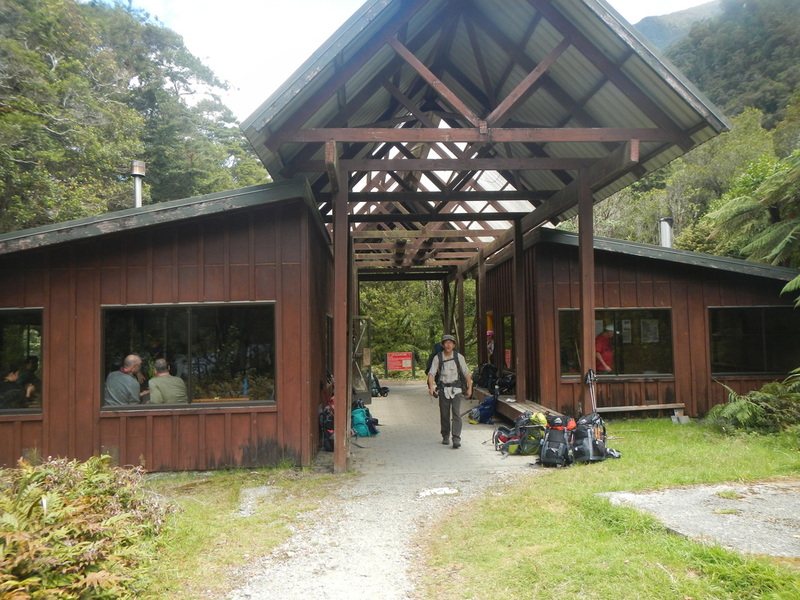 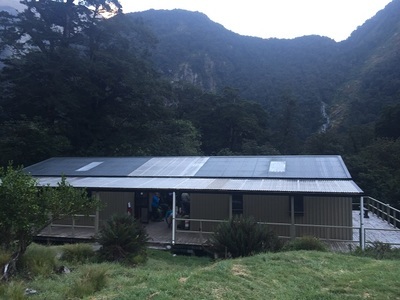 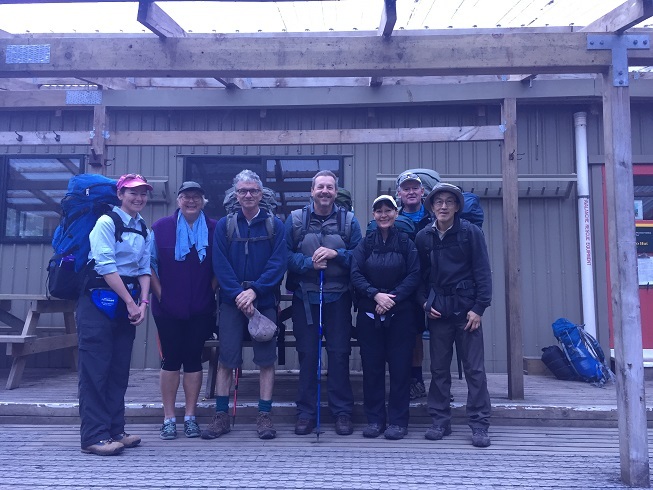 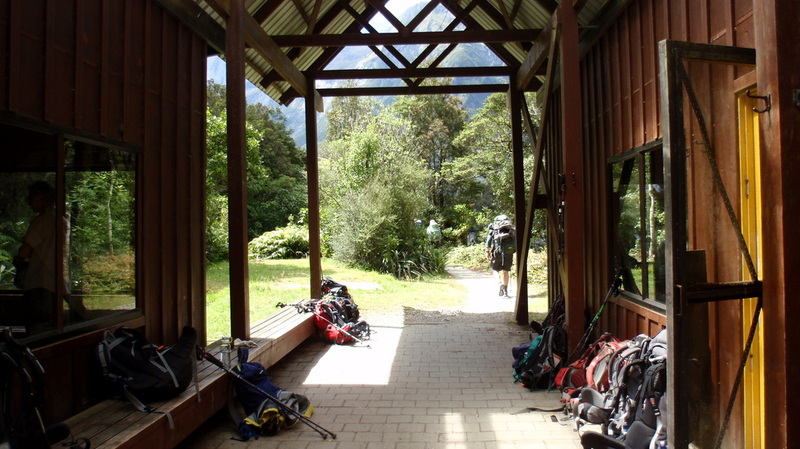 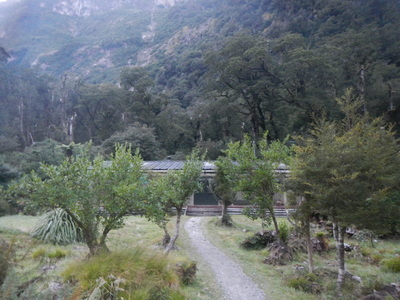 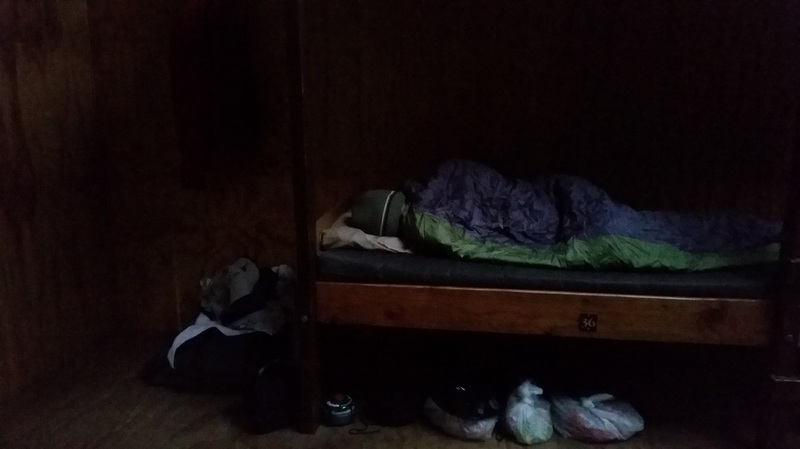 The Ranger at Clinton Hut warned us to pick up our boots from outside the Mintaro hut as the Kea's were quite troublesome. I might add also that if you ventured outside at dawn or dusk the sand flies would carry you off. 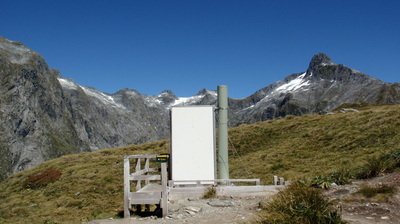 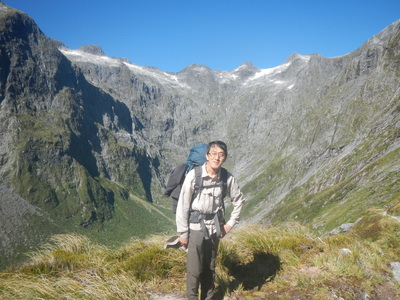 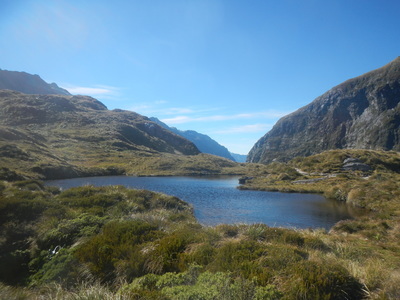 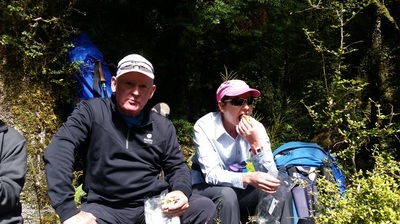 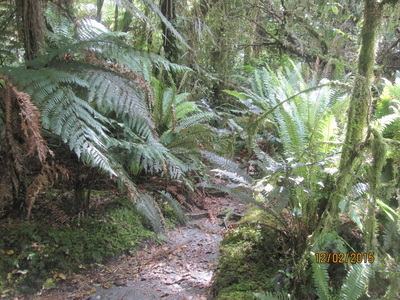 Day 3 to Dumpling Hut - Stage 1 McKinnon Pass. 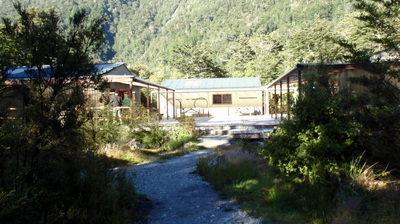 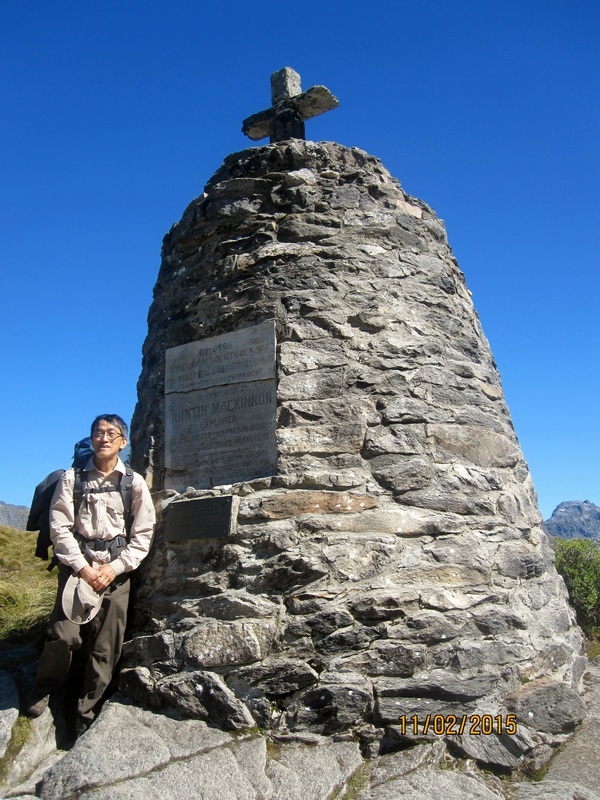 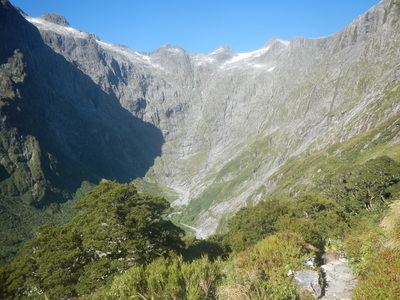 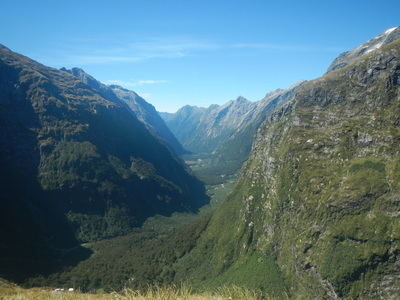 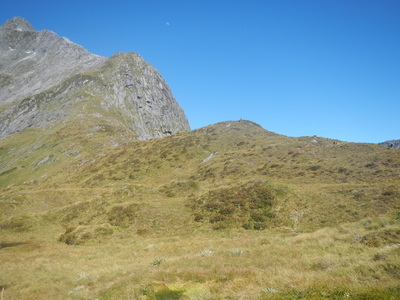 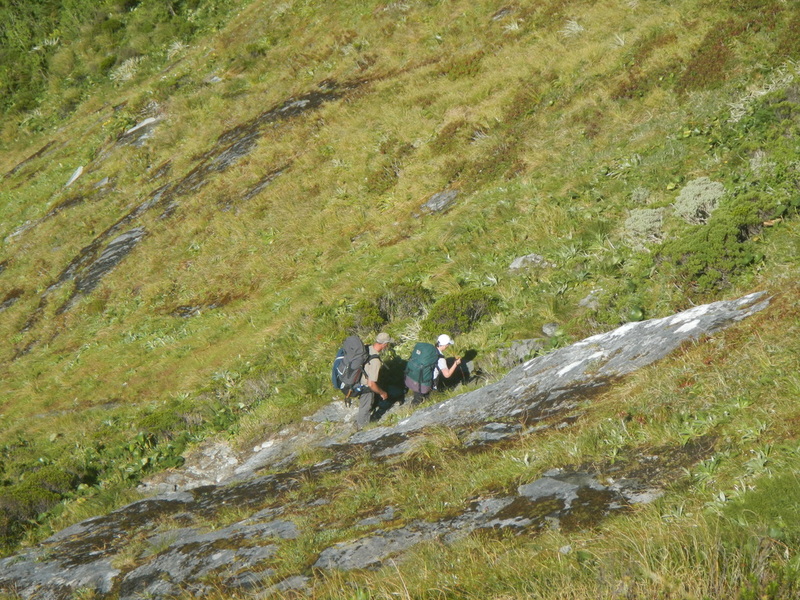 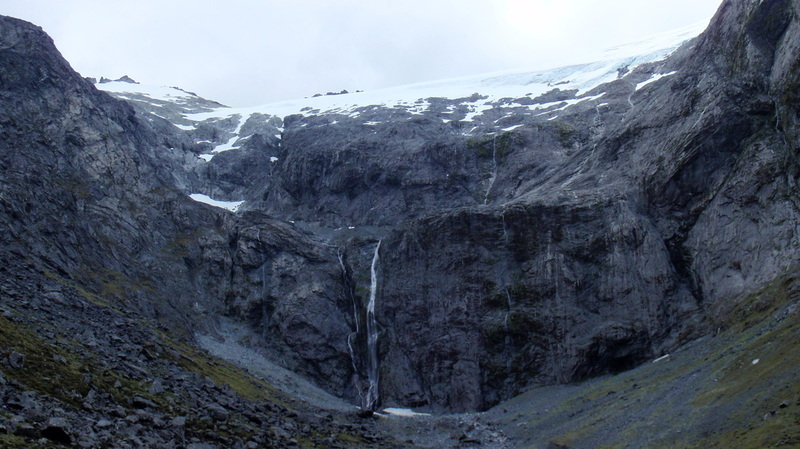 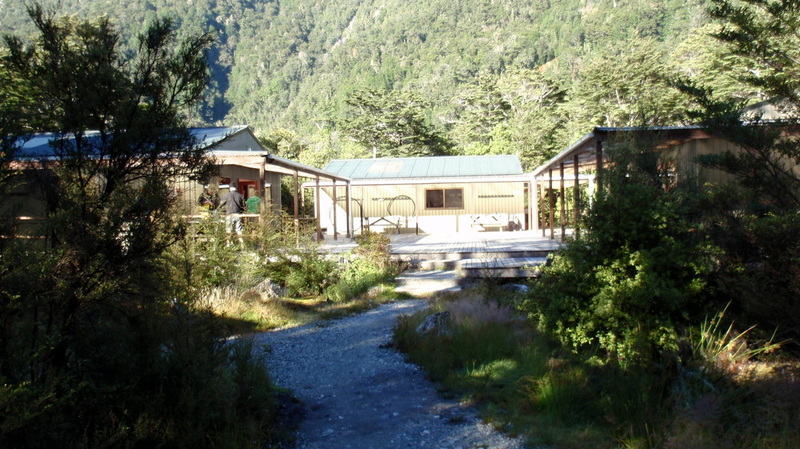 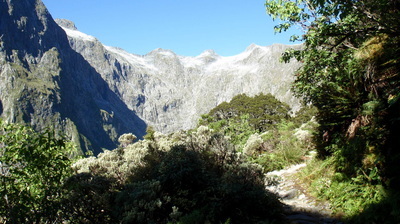 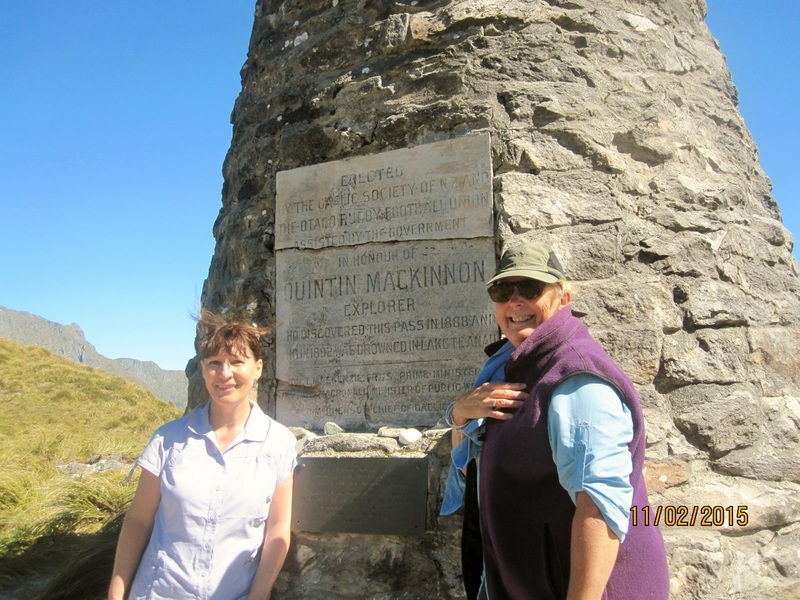 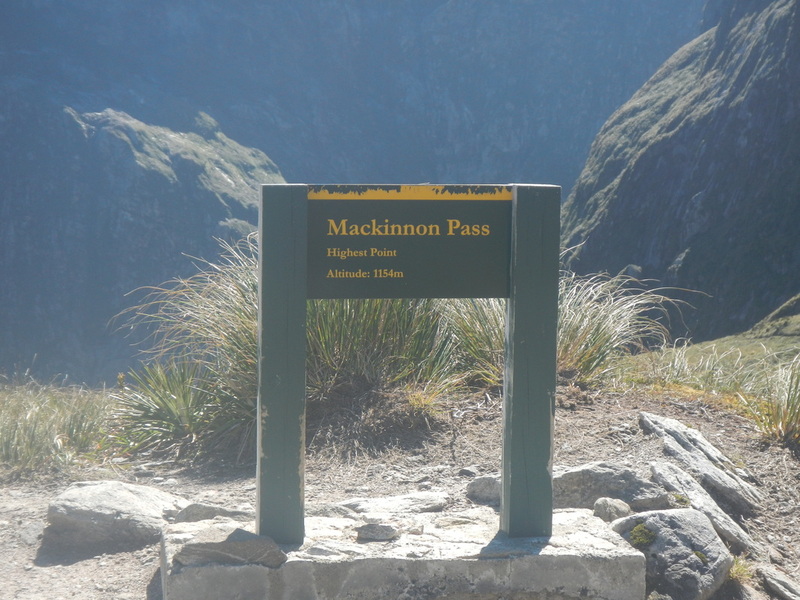 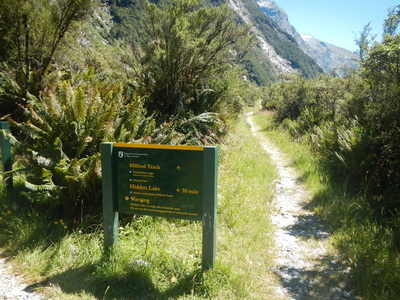 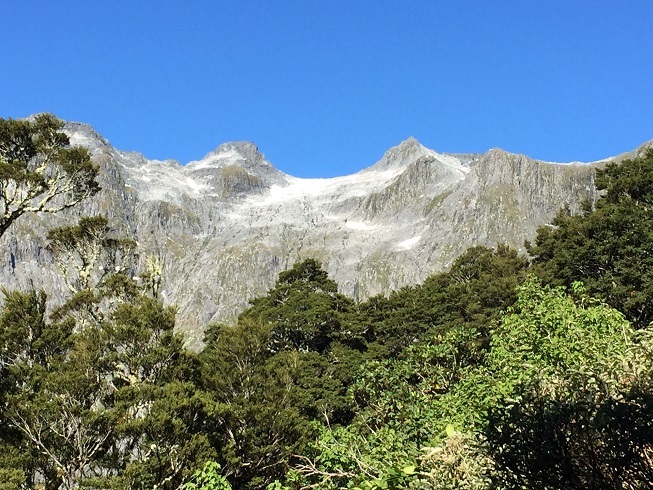 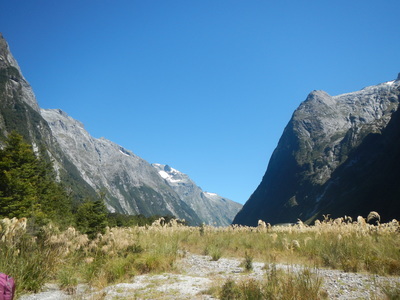 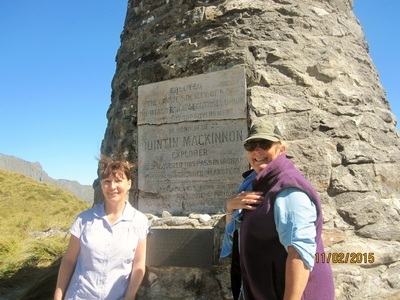 Today is the day we would climb up and over McKinnon's pass. 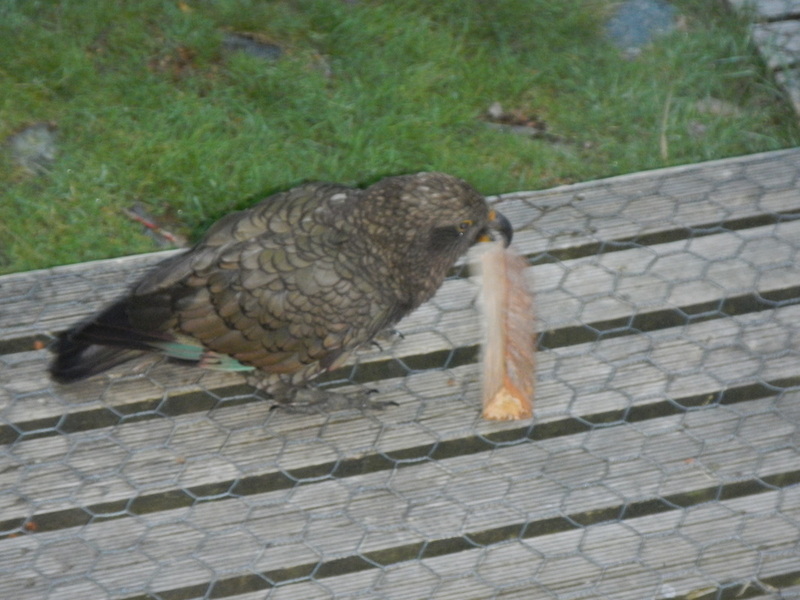 So as predicted we did wake up to the noisy Keas who would have a chew of anything. They reminded me of a naughty delinquent gala and twice as destructive. But after breakfast we headed off. 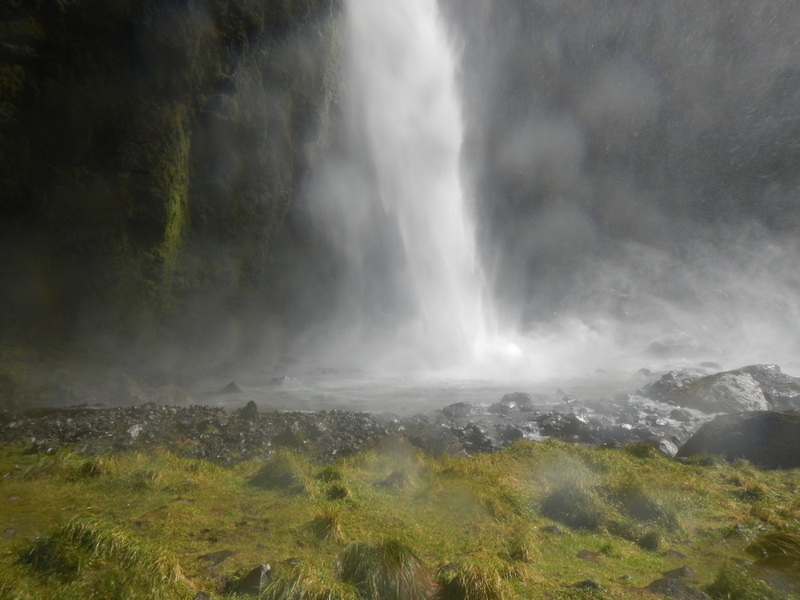 The early morning mist meant that temperatures were quite high. 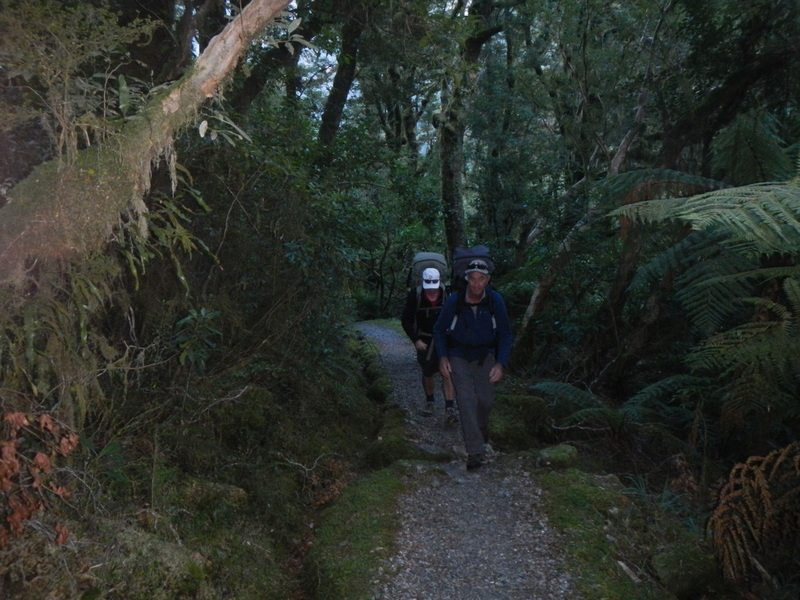 We also gave ourselves an early start as this would be a big day. 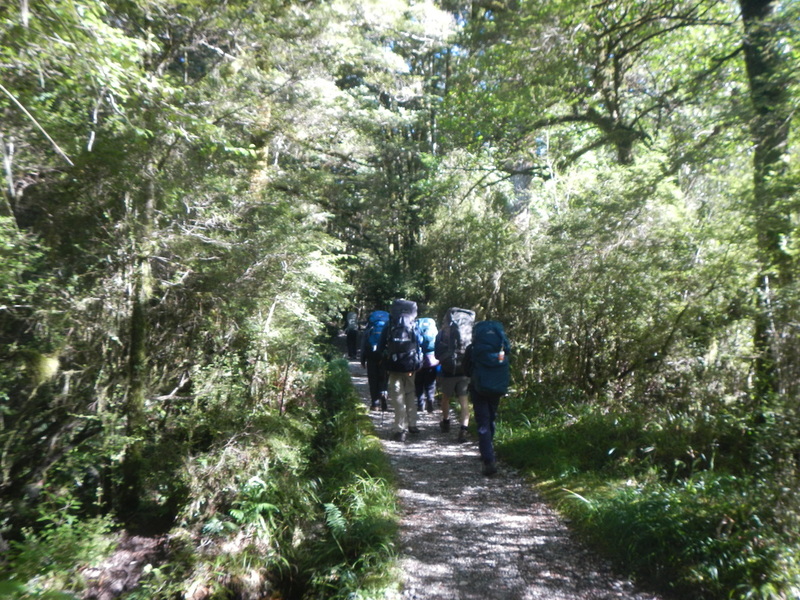 I should also say that were walking with 32 other DOC members plus a large contingent of an organized walk. 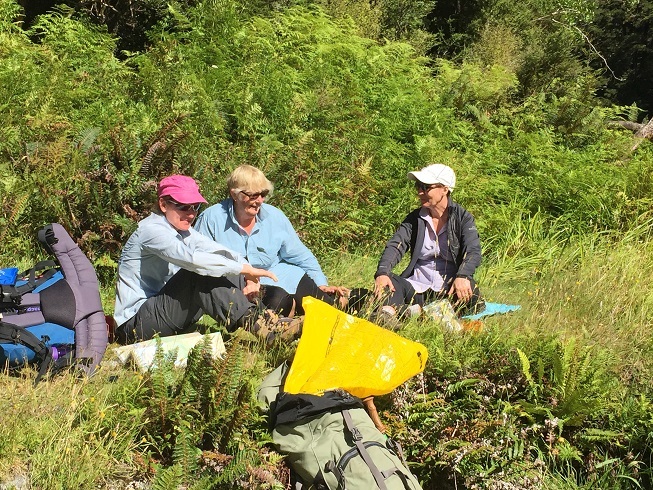 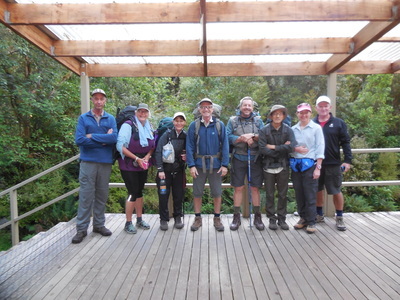 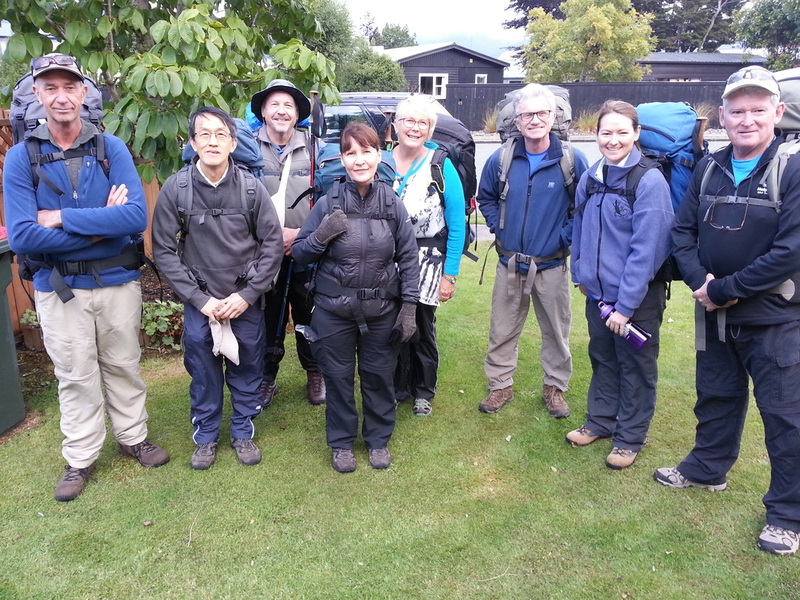 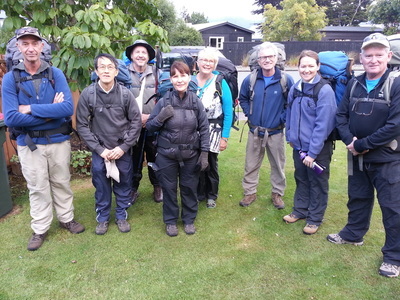 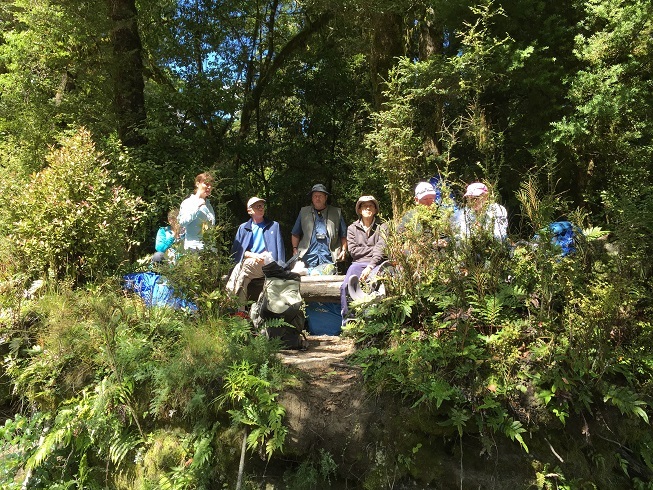 This other group had guides, separate huts and shelters, and meals and hot baths and .... but they were a friendly bunch mostly. 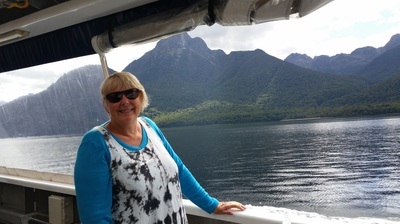 Even in this remote part of the world we were still getting doubtful news casts on the Queensland and federal political environments. 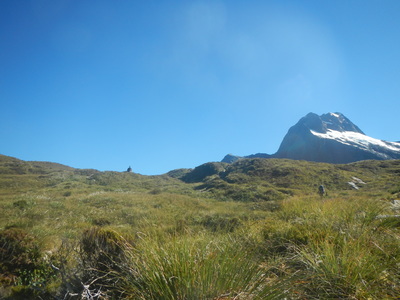 It was pretty special reaching the pass with a cloudless sky, a ring of mountains and high snow and waterfalls everywhere. It also was a lot warmer than we had expected, so it was quickly off with a few layers of clothing. We came up the hill like browns cows but just as they did so did we. 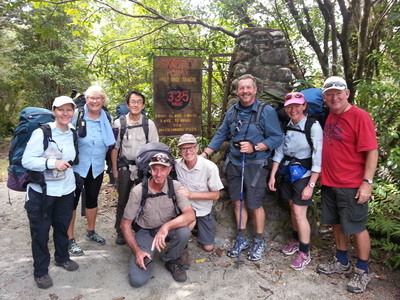 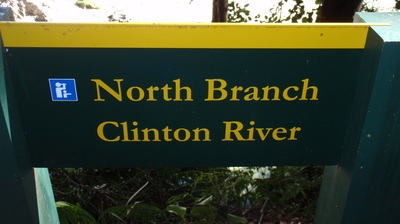 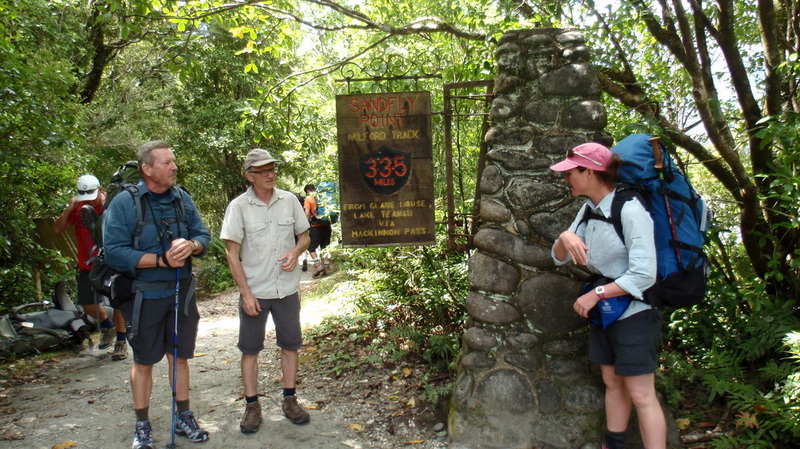 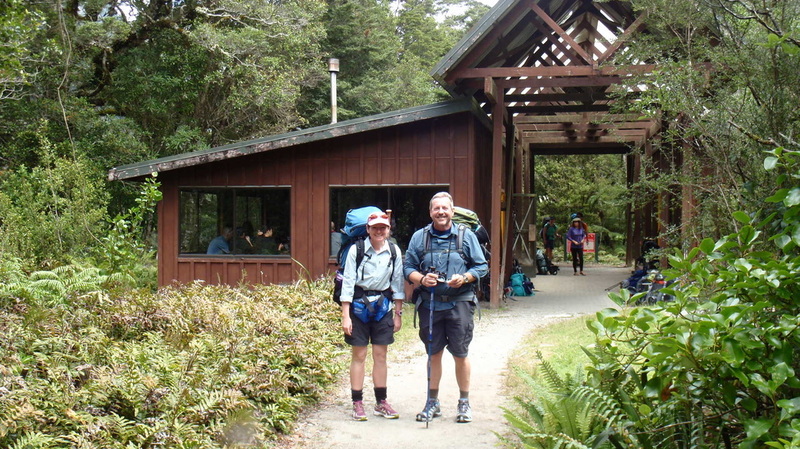 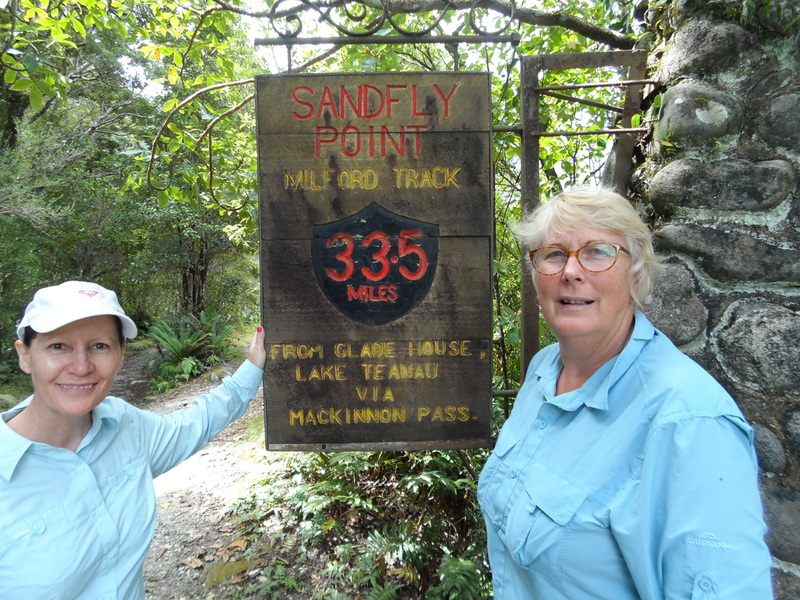 Day 4 to Sandfly Point. 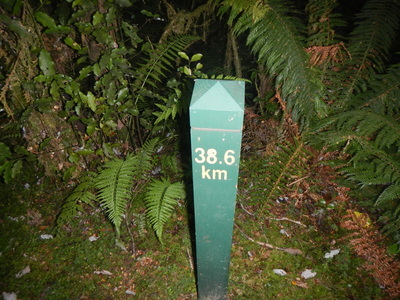 This would be the longest day of 18kms so we set out again quite early. We were planning on getting the 3pm boat across to Milford from the point. 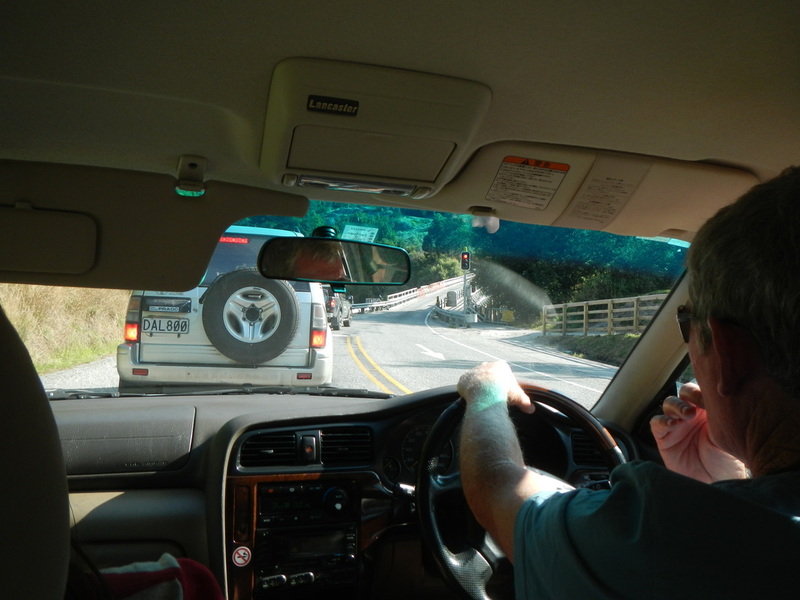 And things went ( as for the whole trip) according to plan. 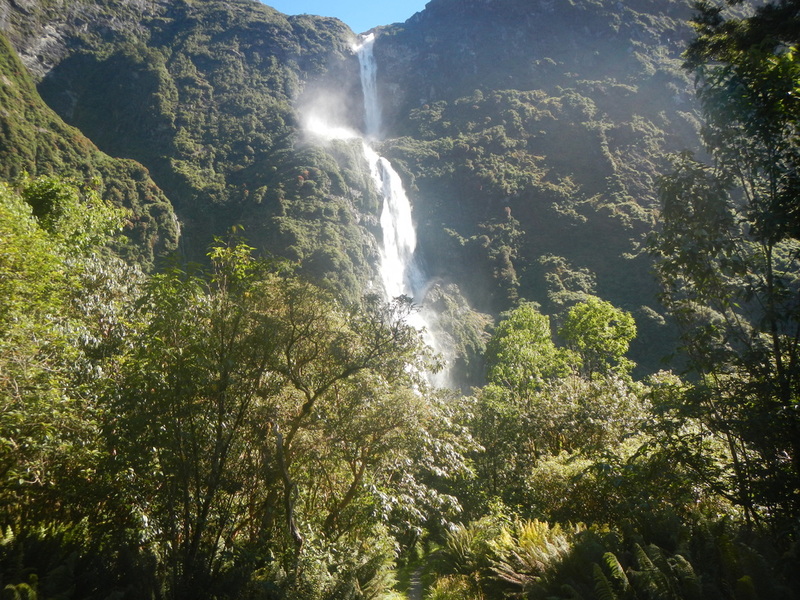 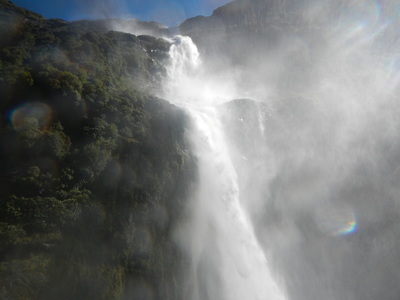 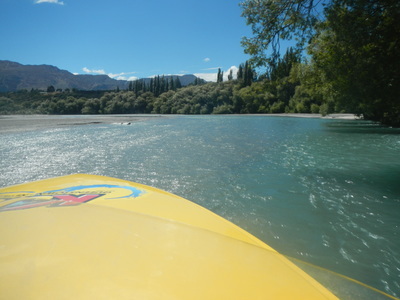 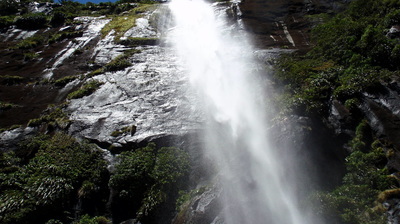 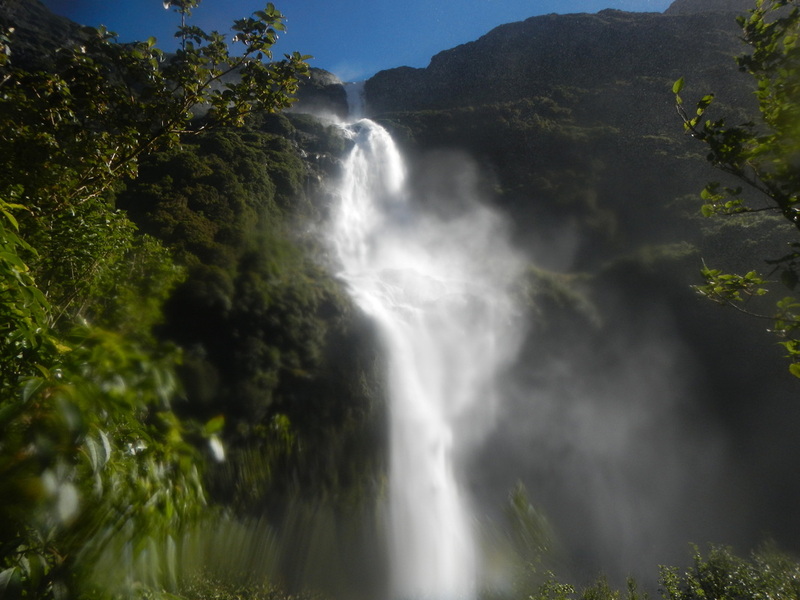 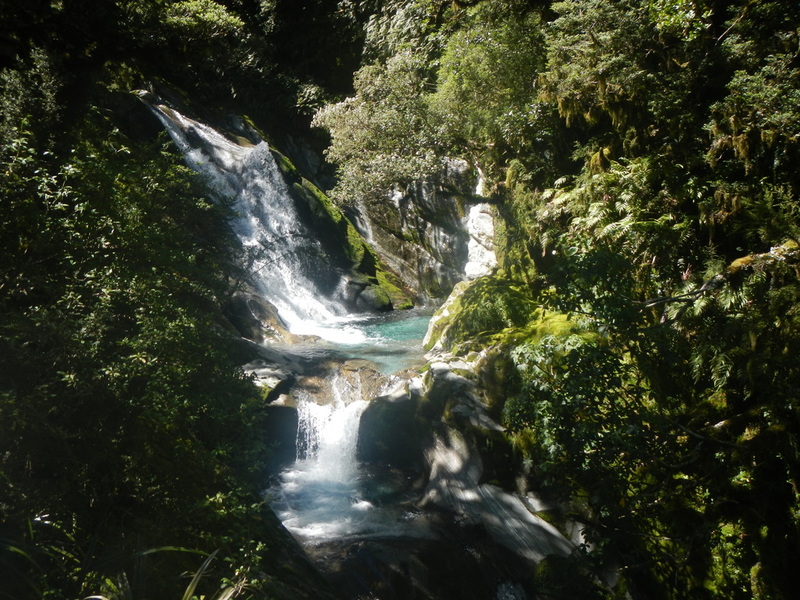 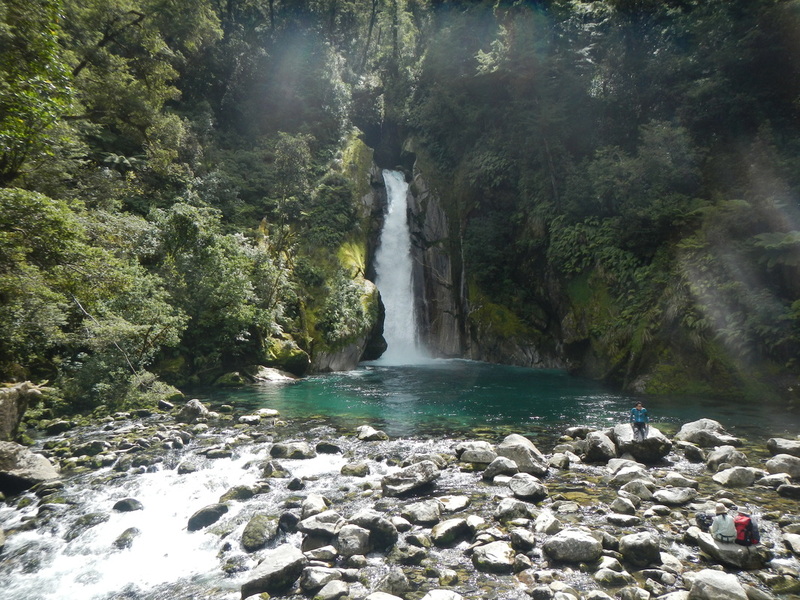 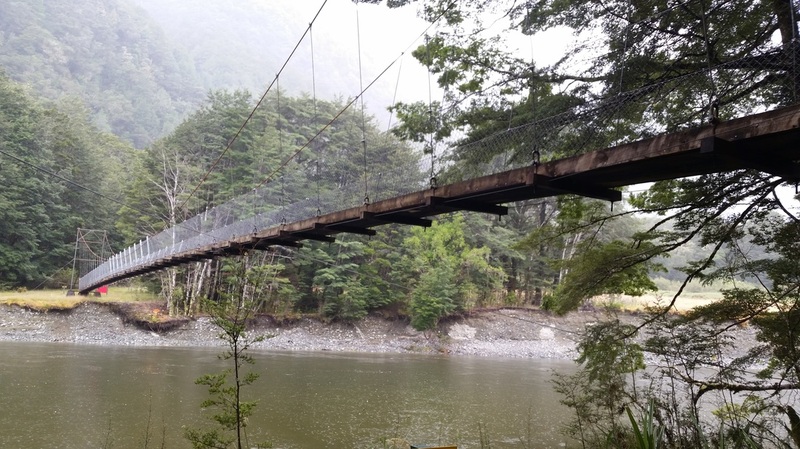 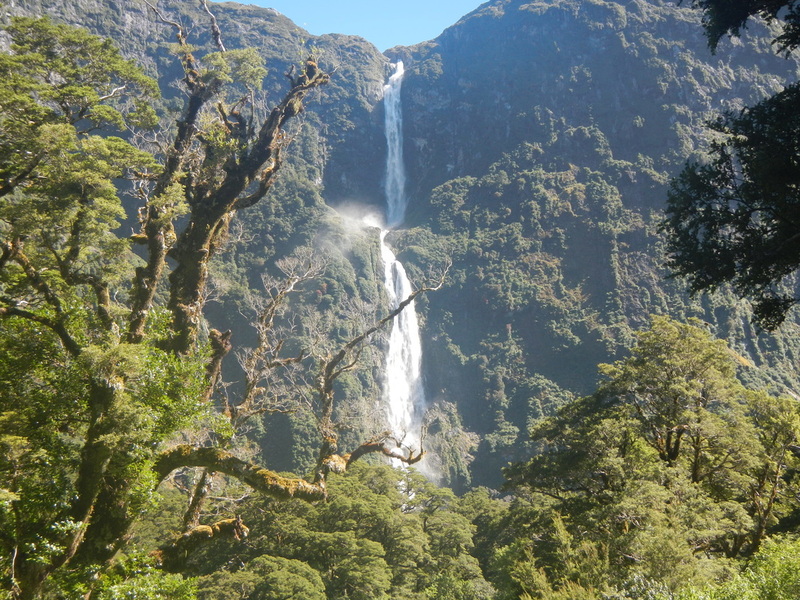 But as for each and every day so far, we had the best - waterfalls, cascading rivers and impossibly clear lagoons, suspension bridges and sand flies... and a cold beer in the cafe in Milford. 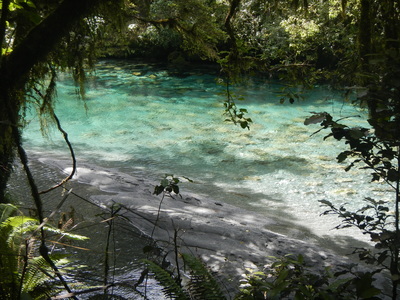 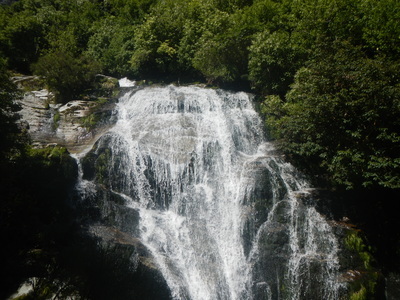 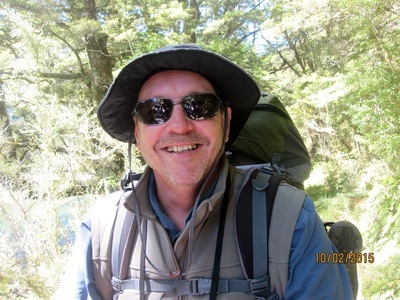 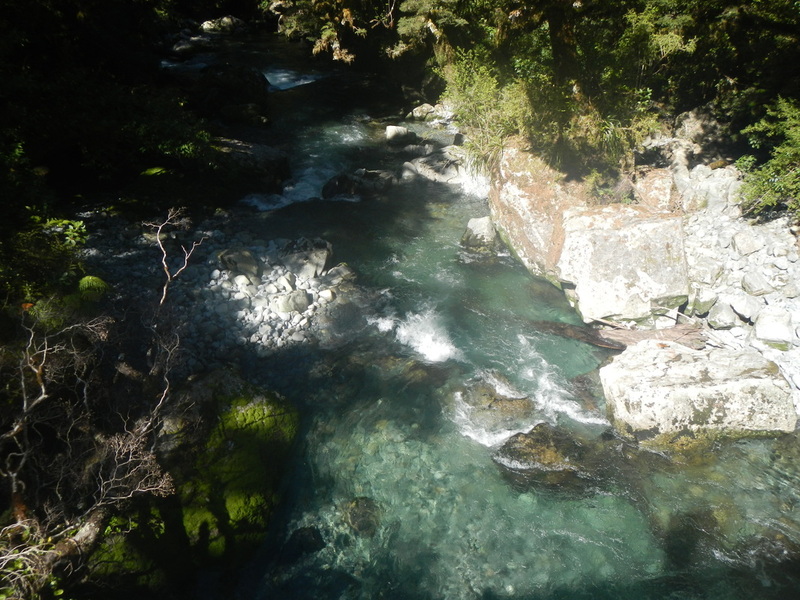 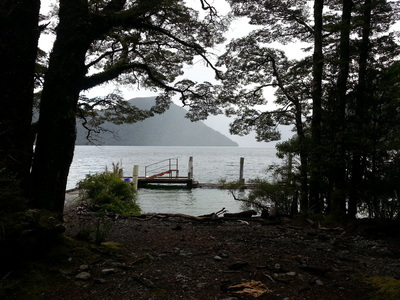 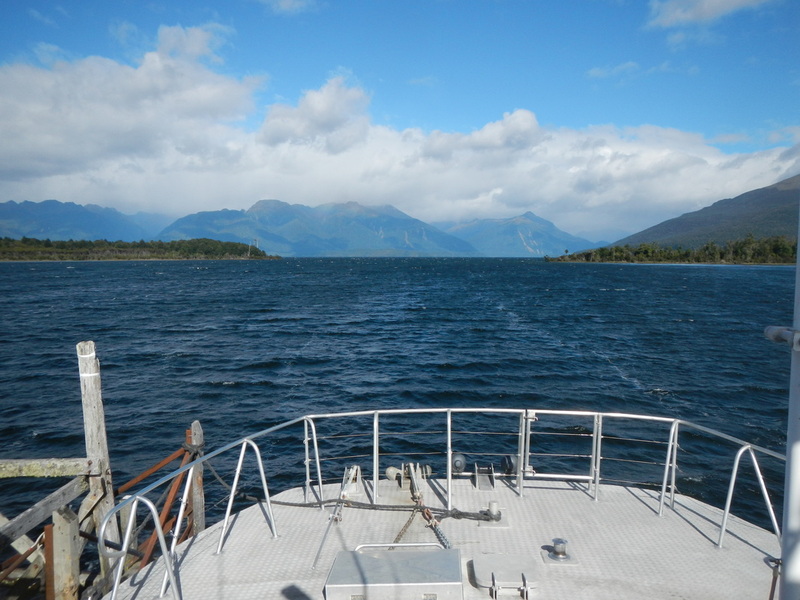 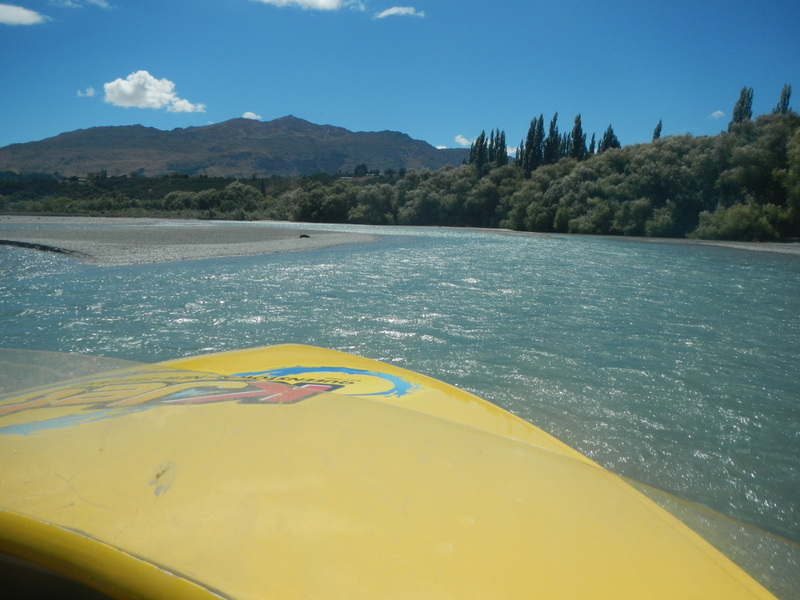 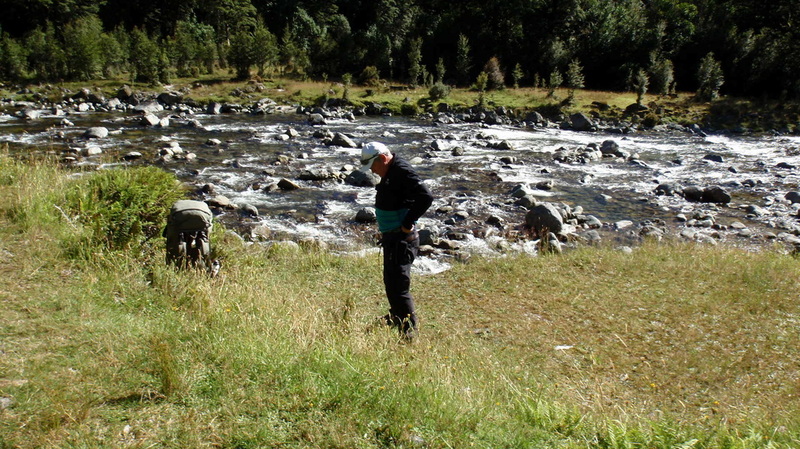 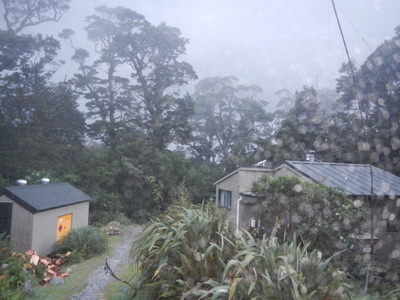 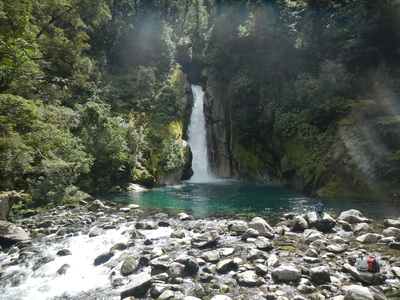 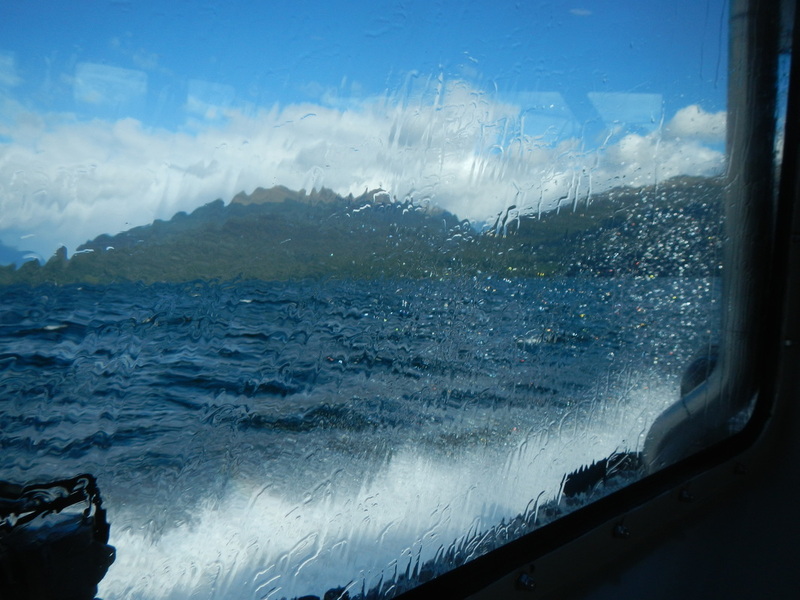 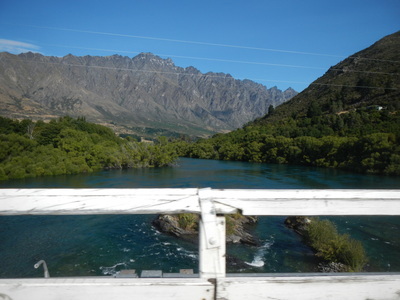 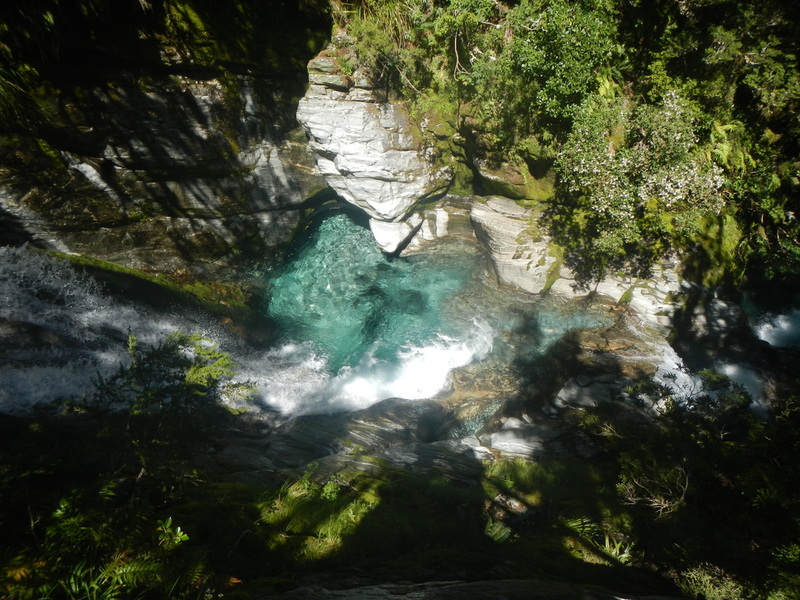 Then a 2 hour bus ride back to Te Anau and a hot shower. 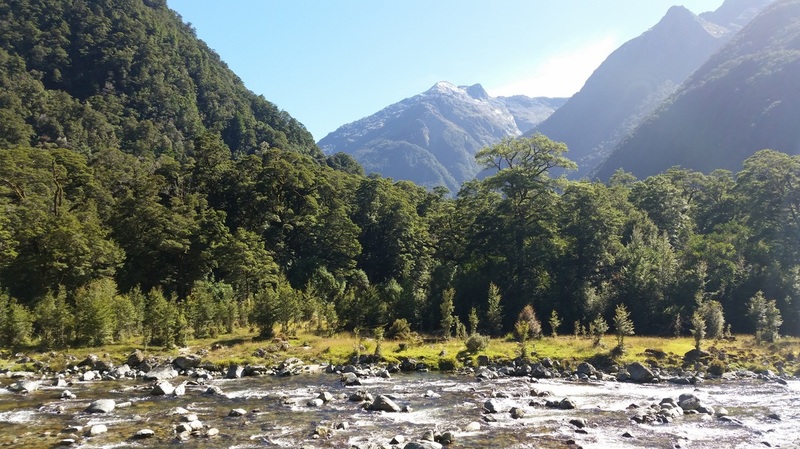 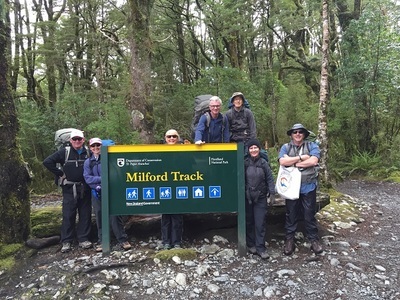 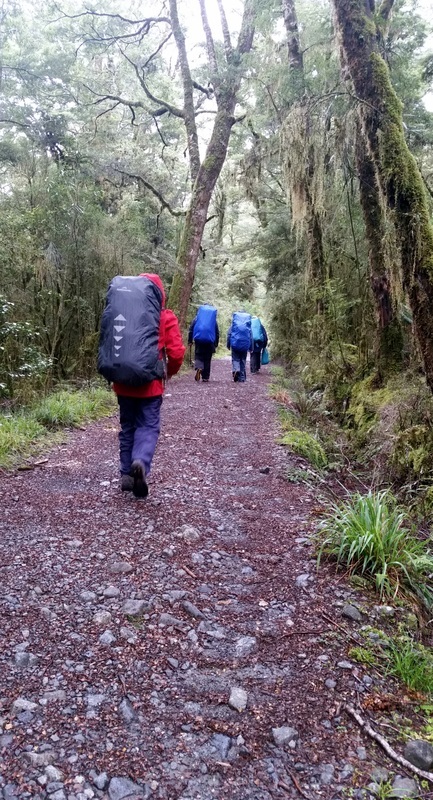 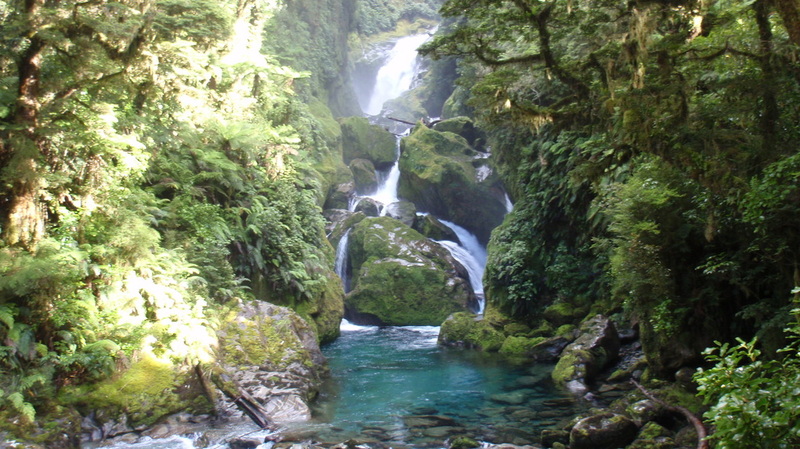 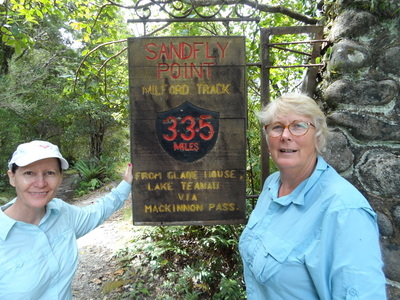 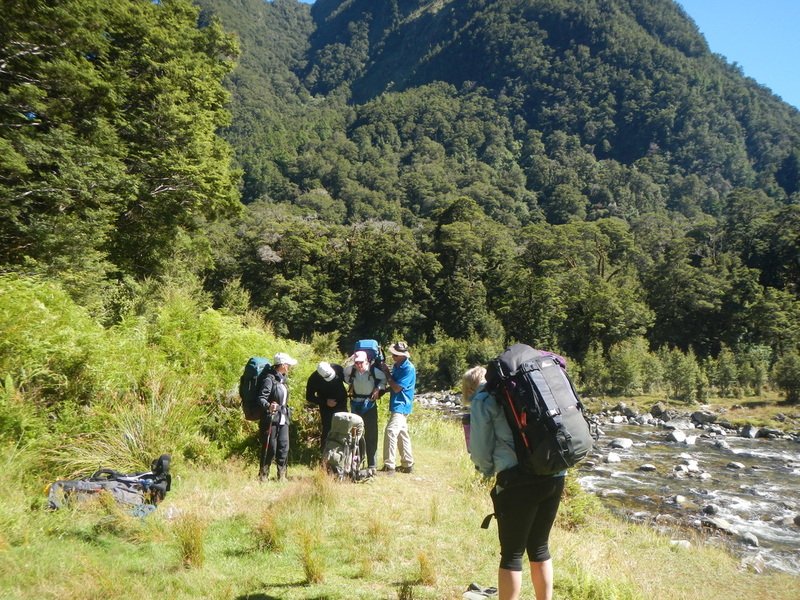 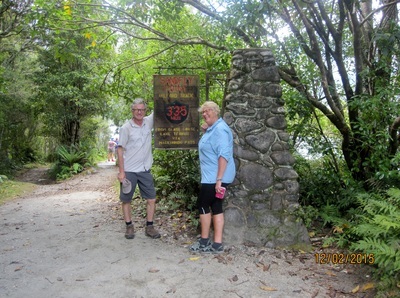 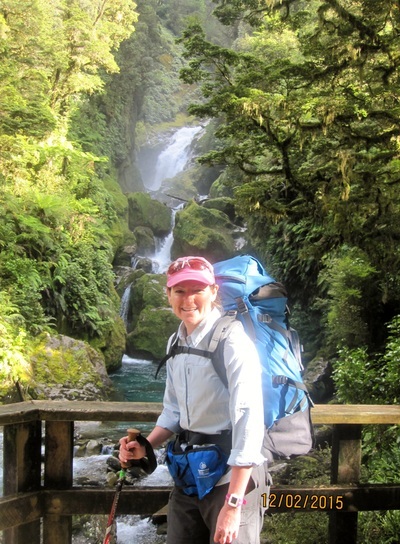 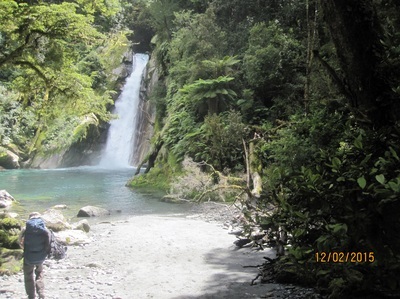 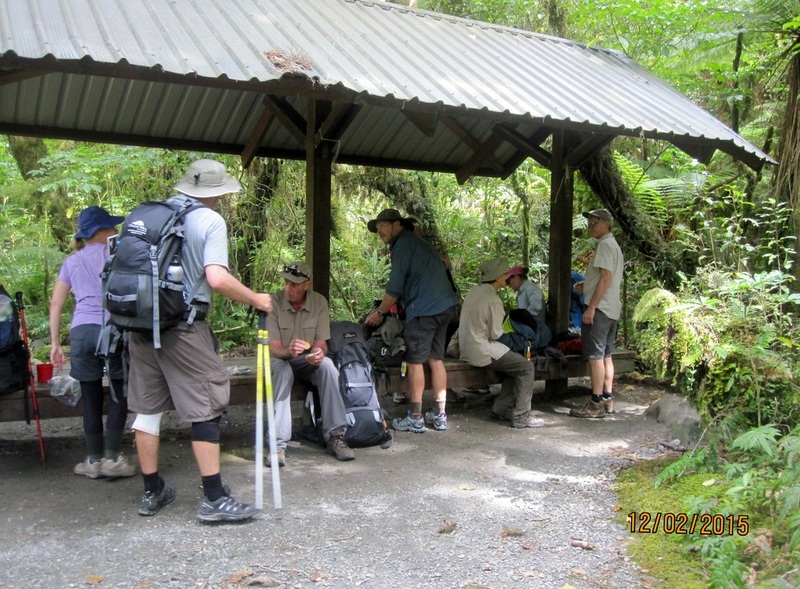 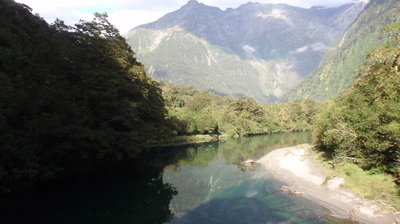 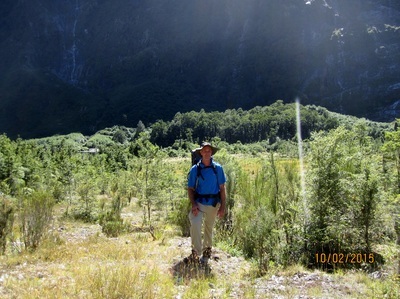 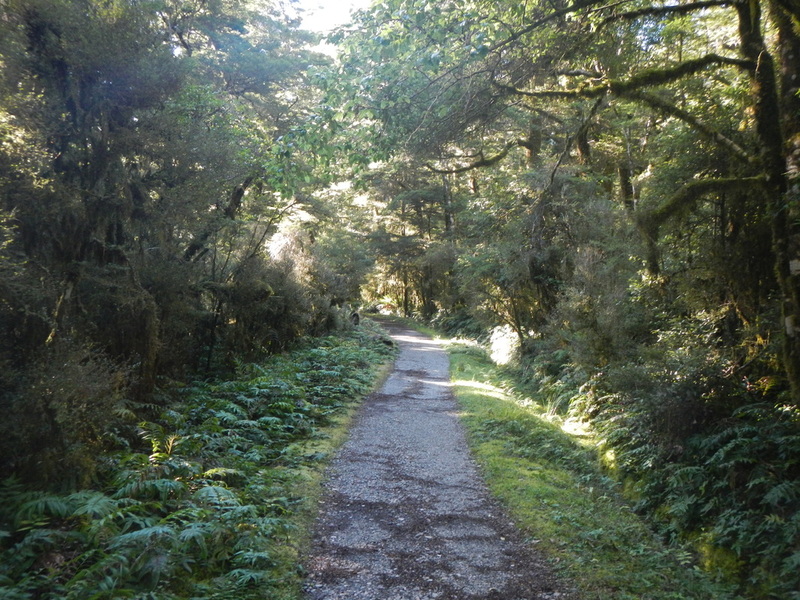 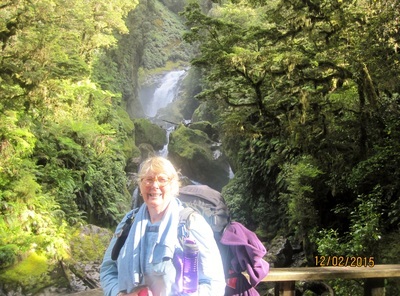 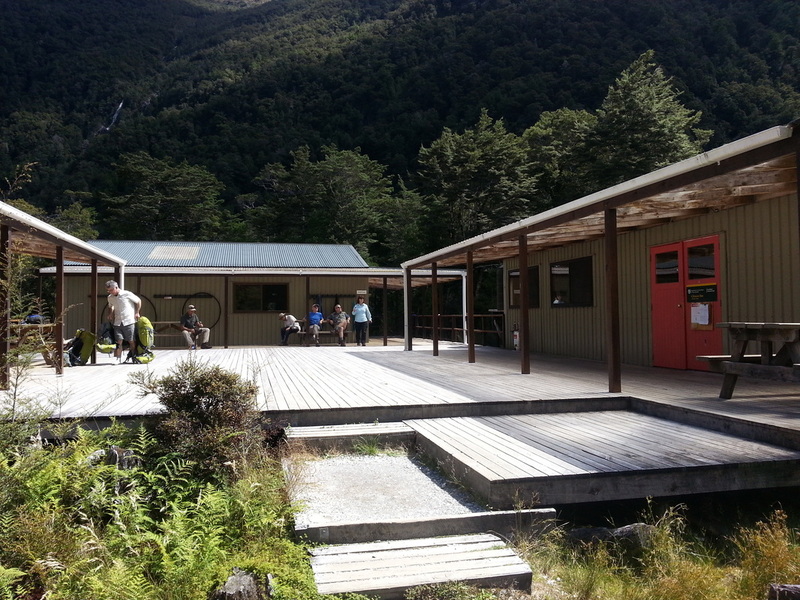 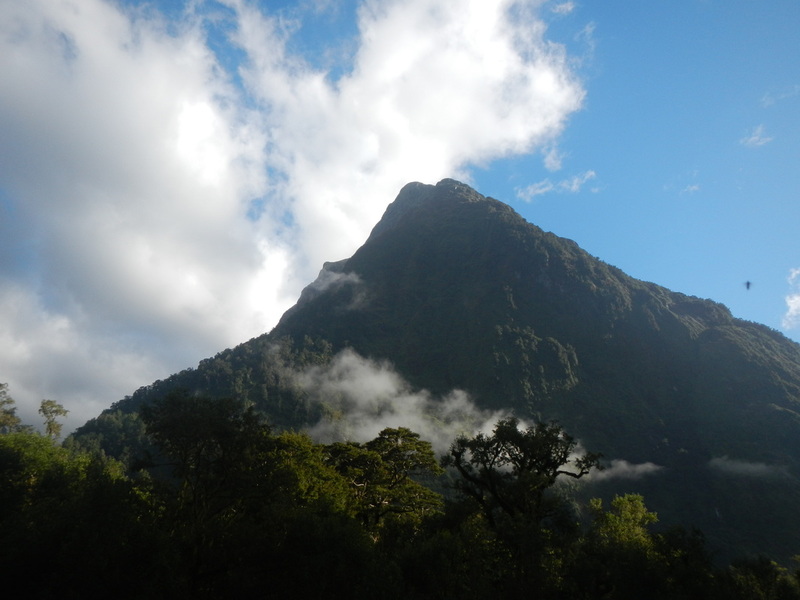 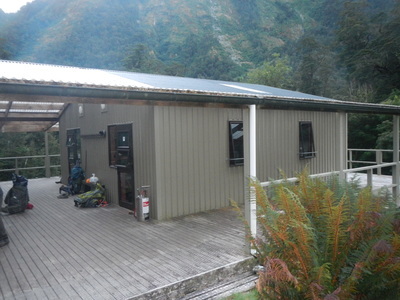 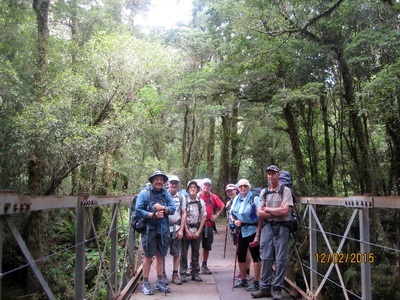 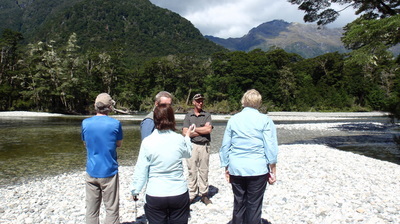 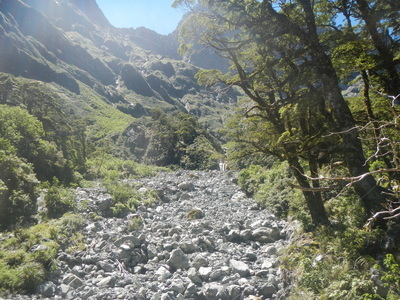 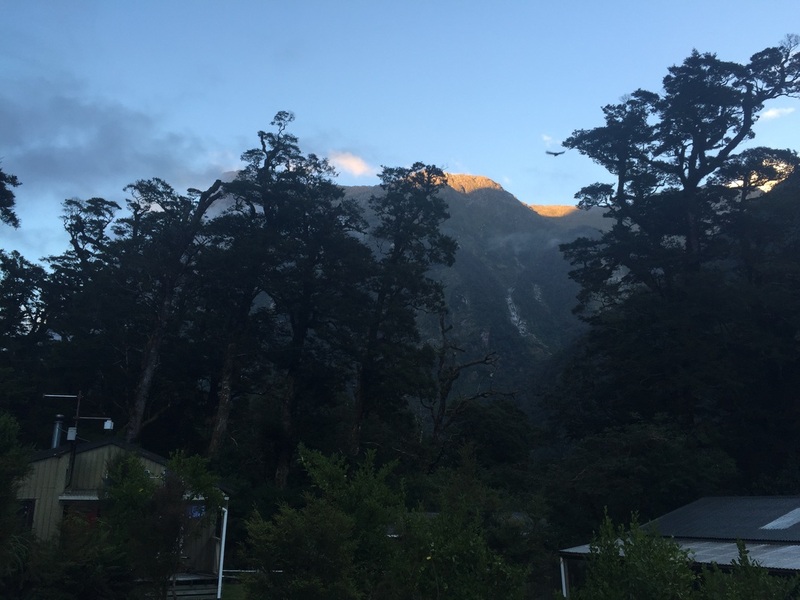 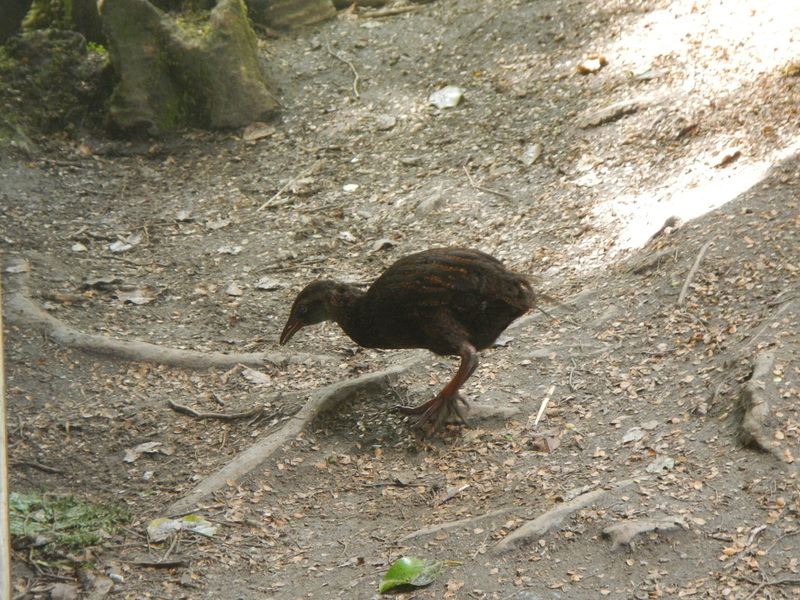 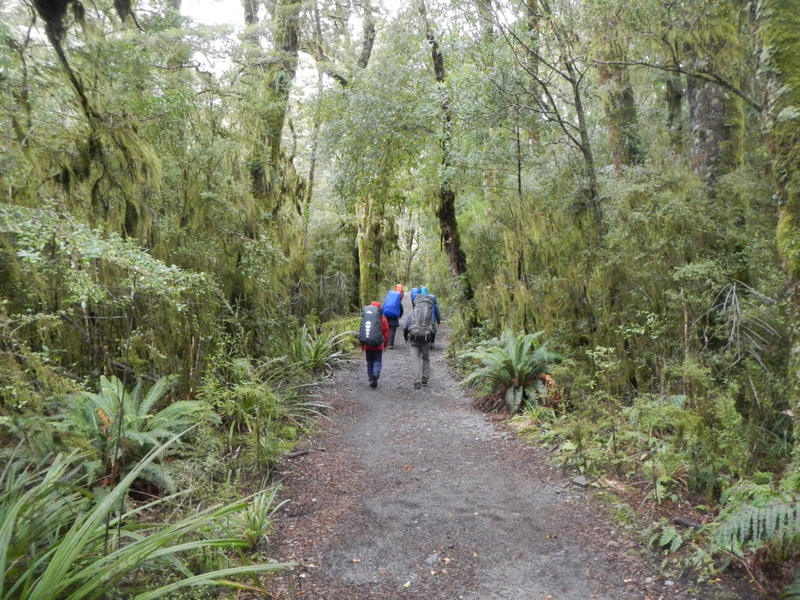 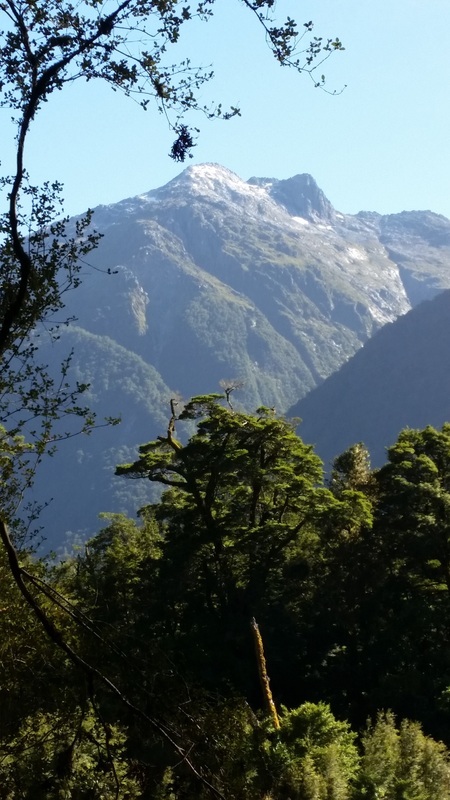 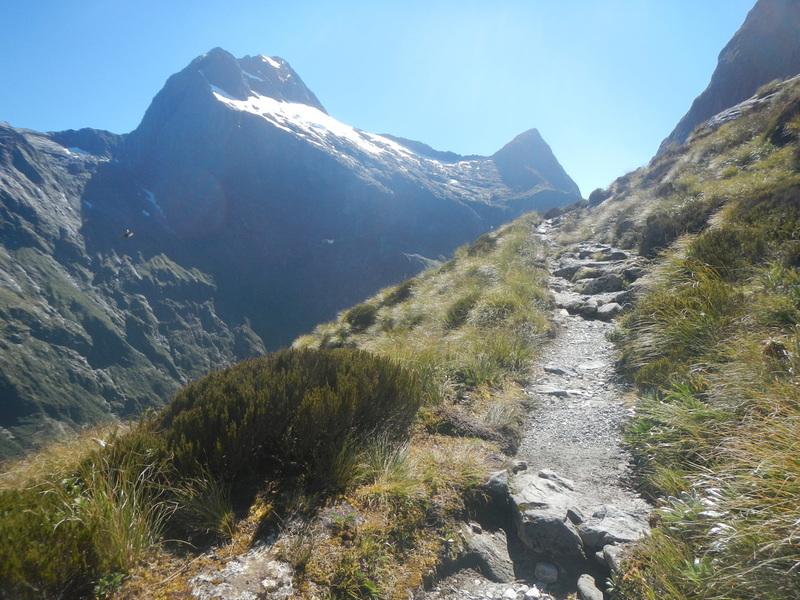 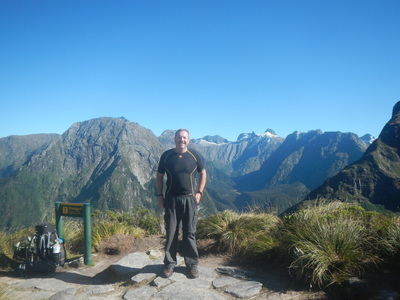 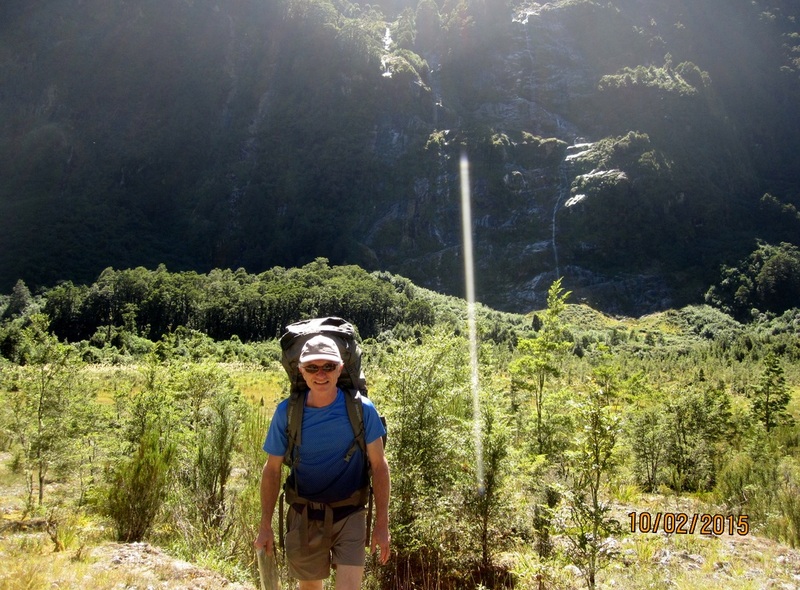 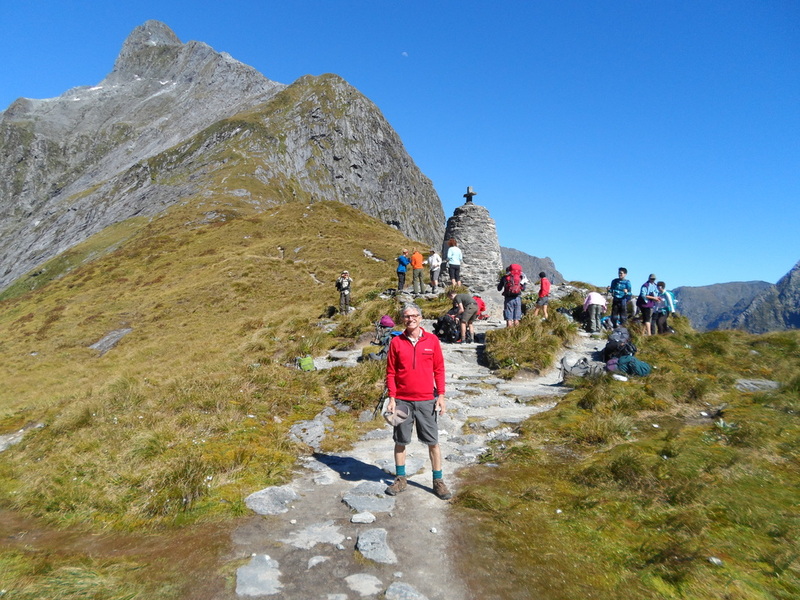 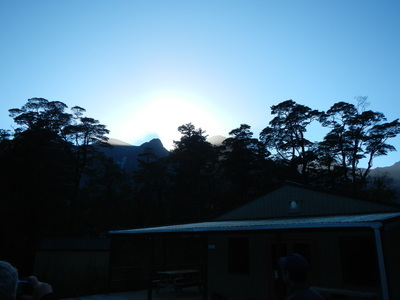 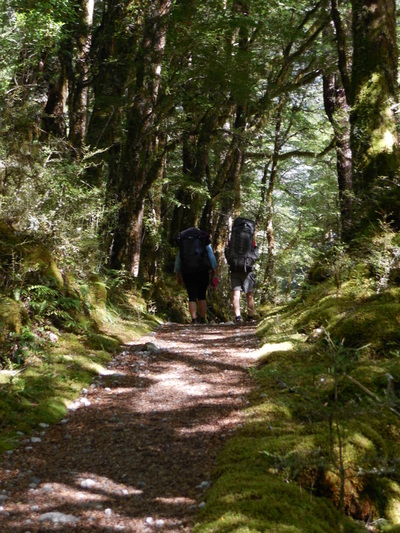 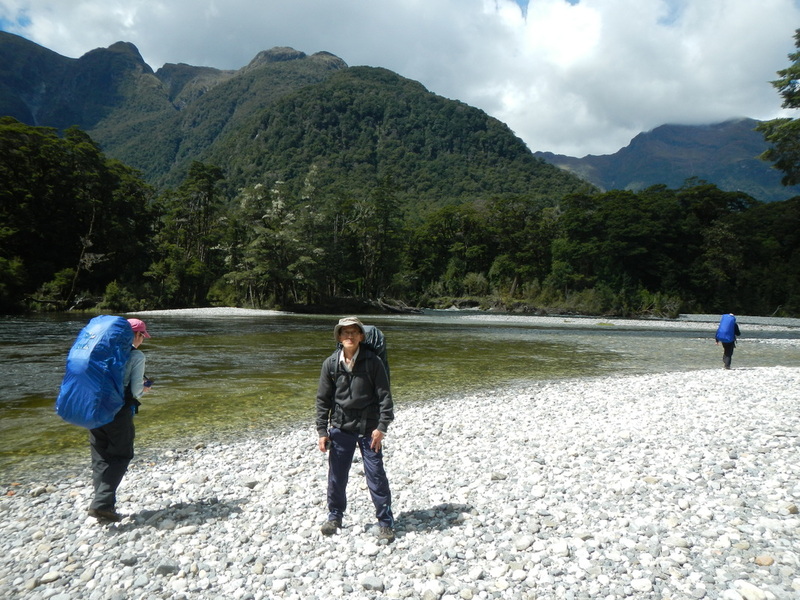 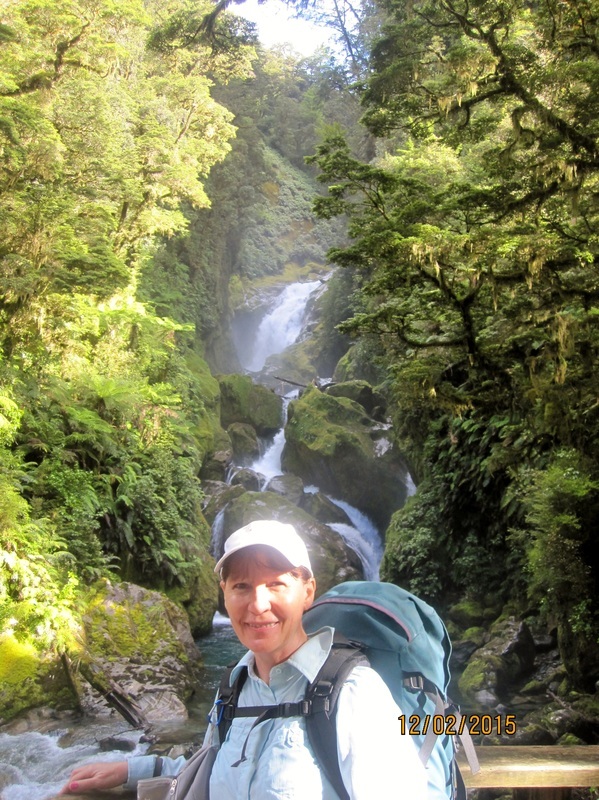 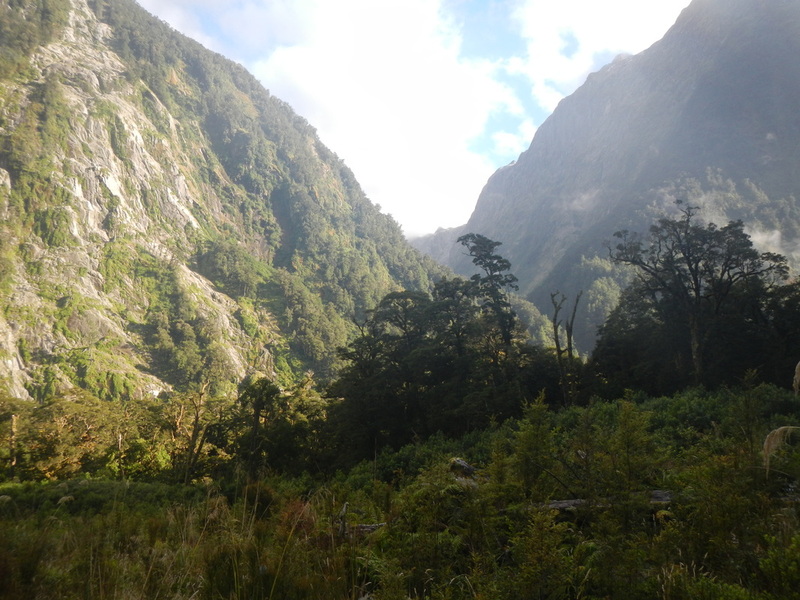 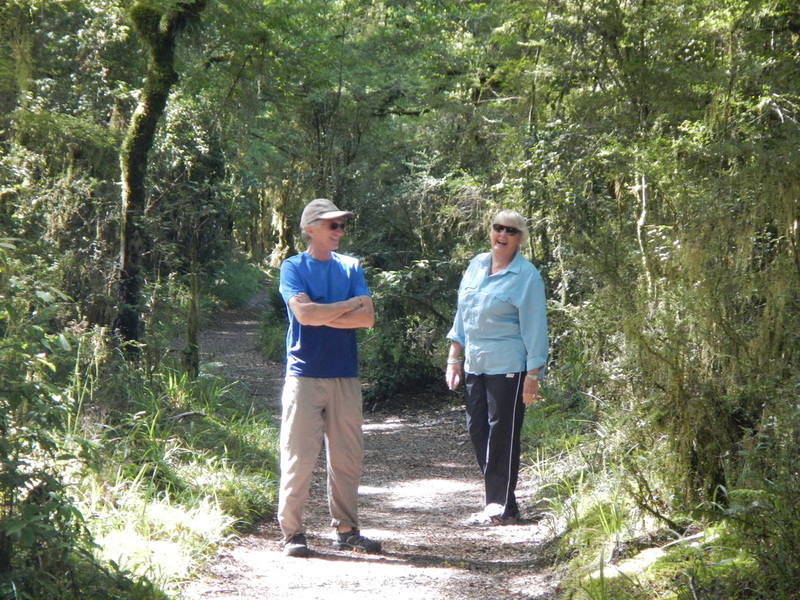 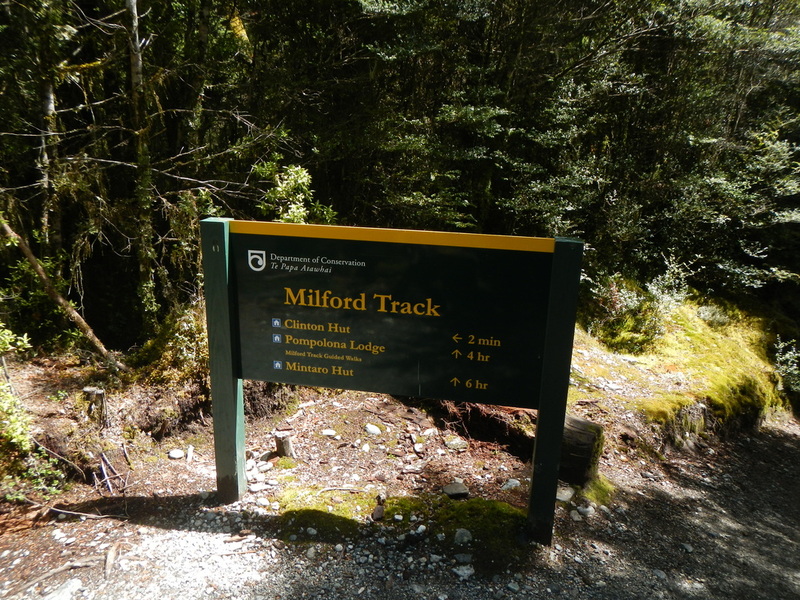 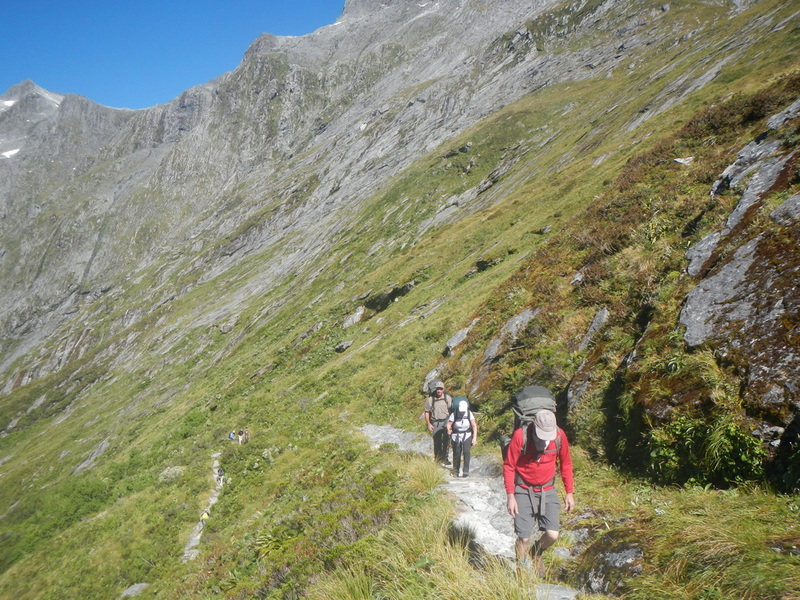 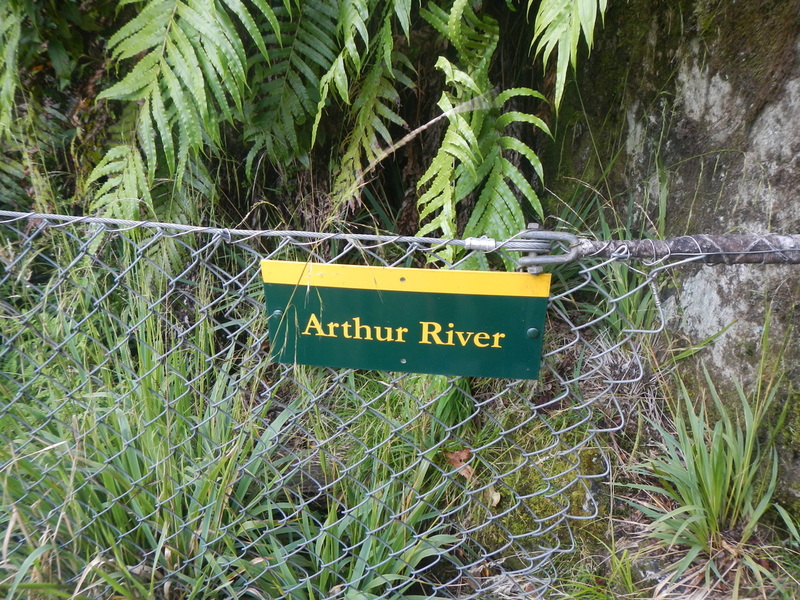 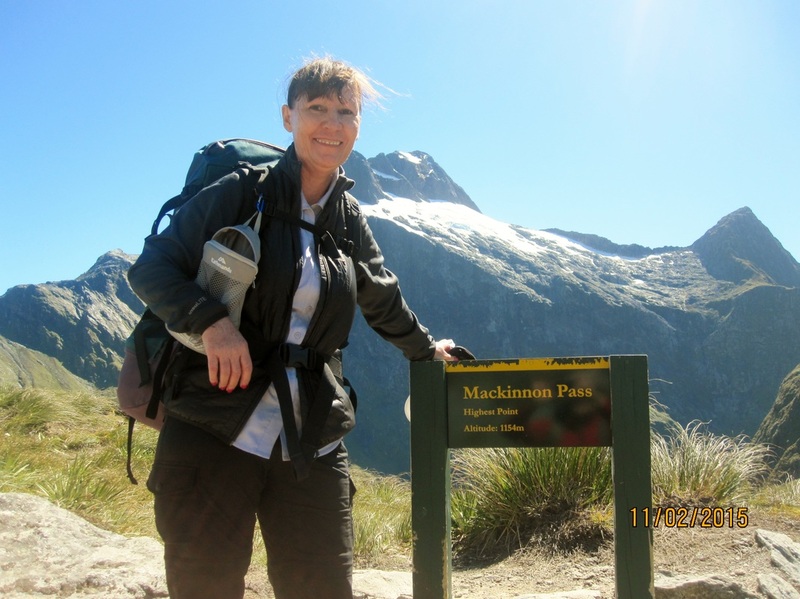 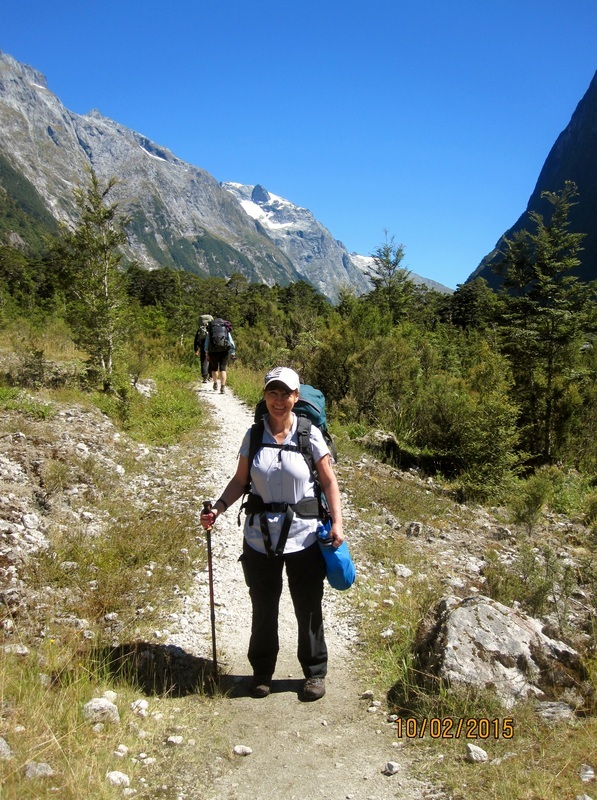 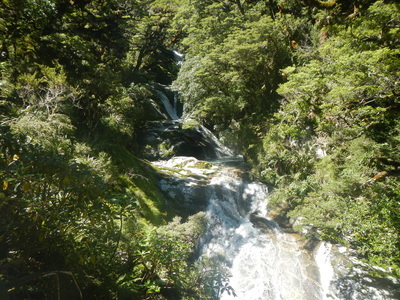 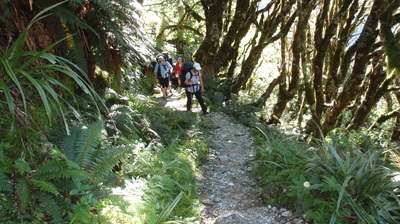 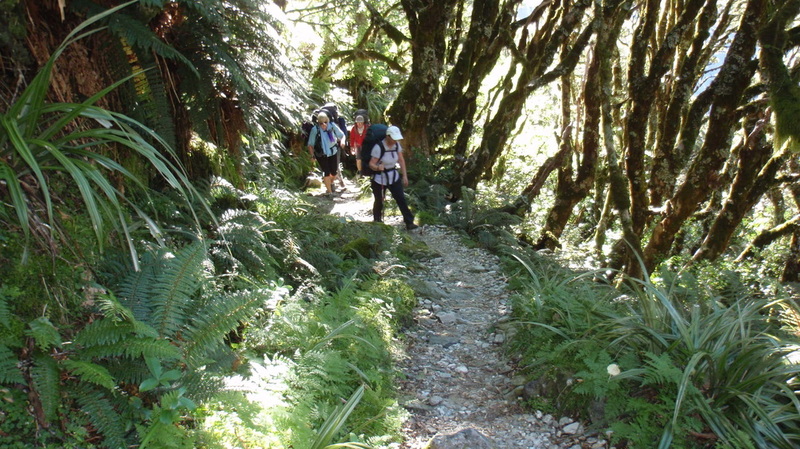 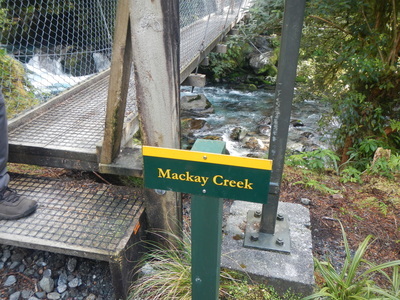 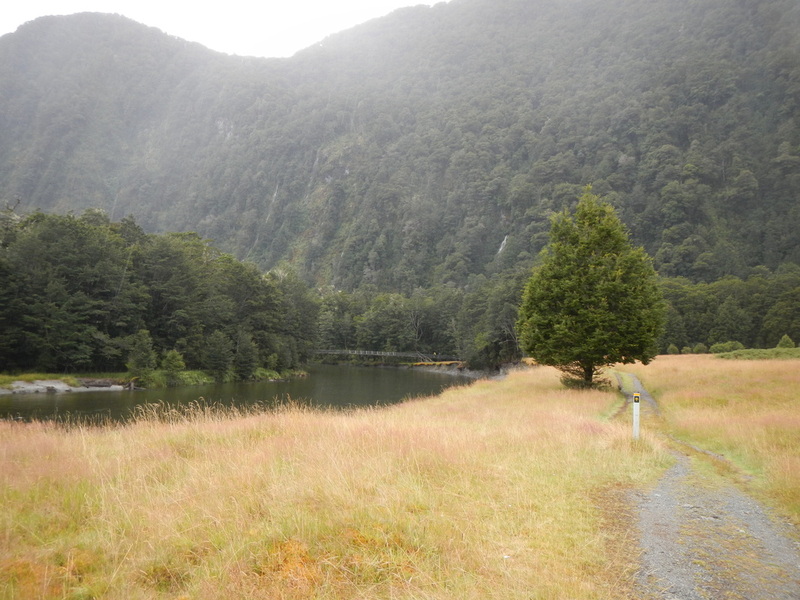 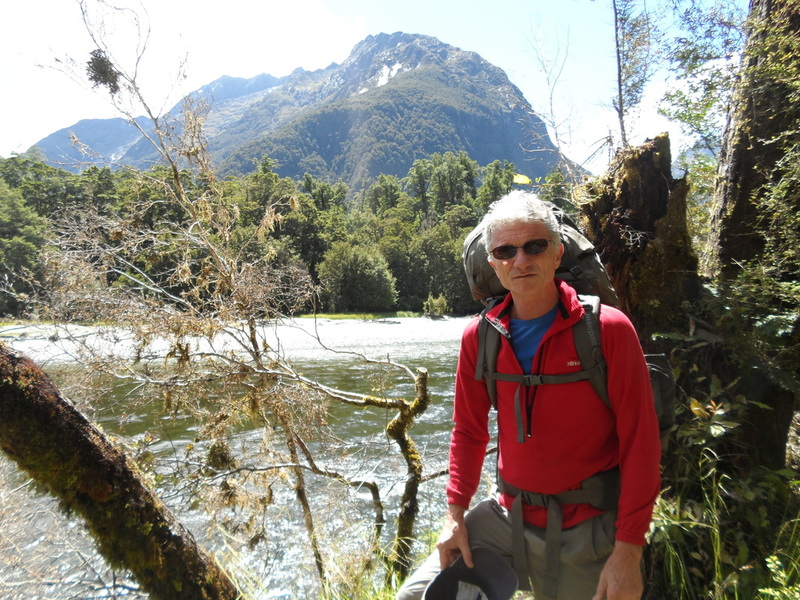 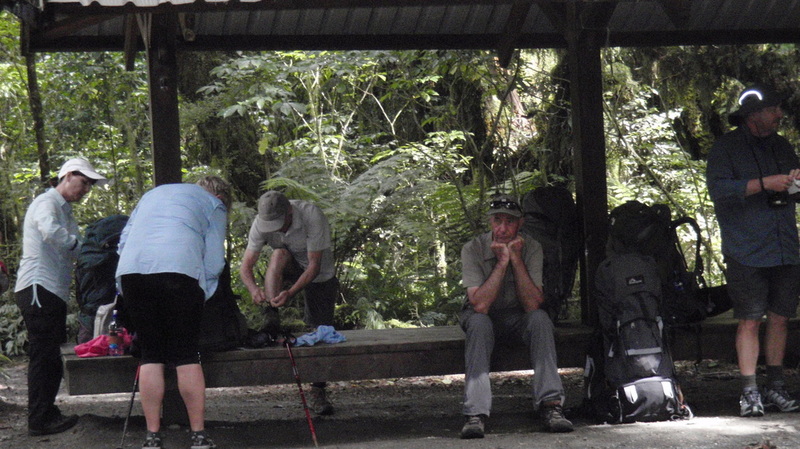 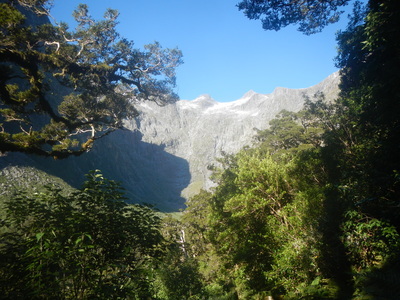 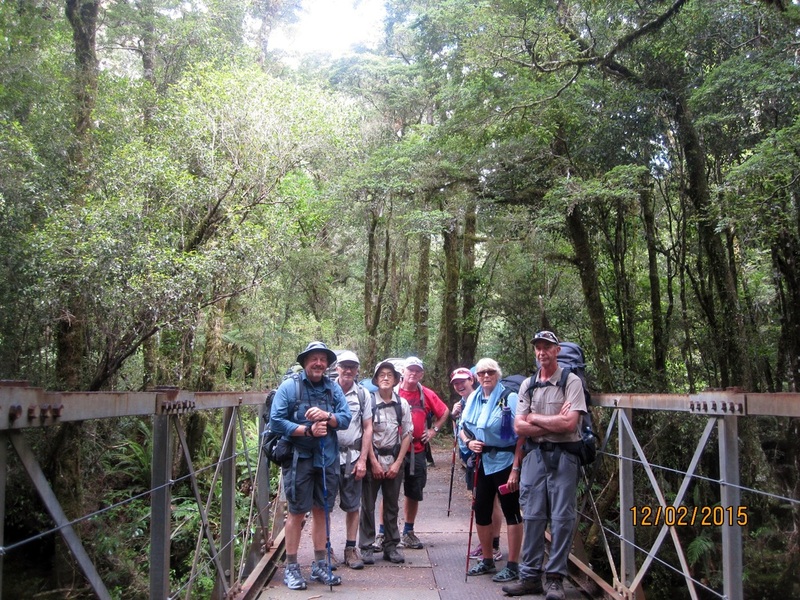 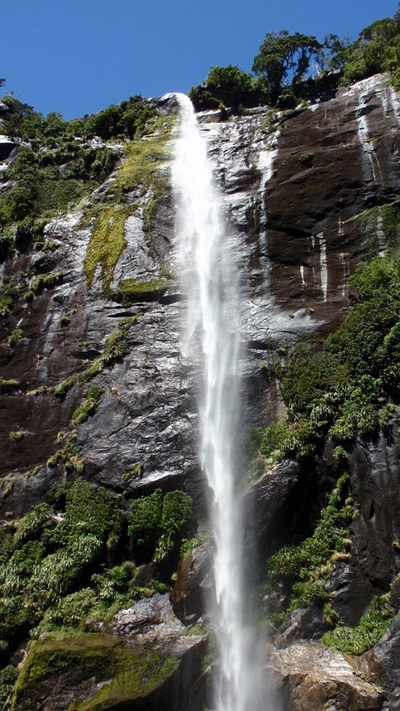 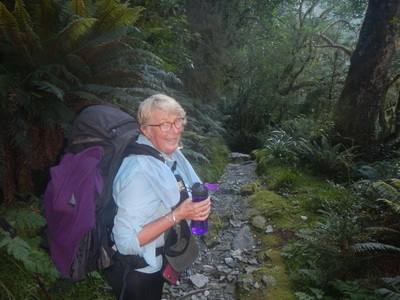 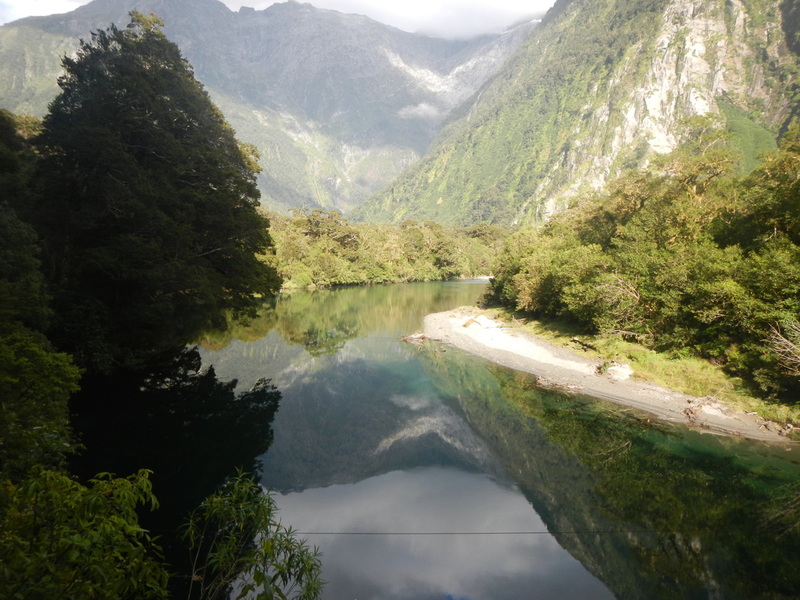 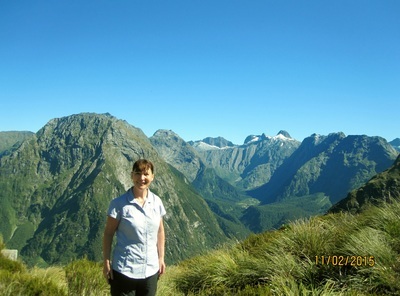 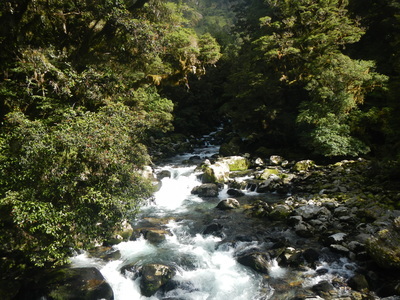 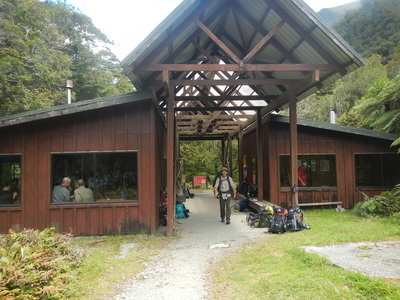 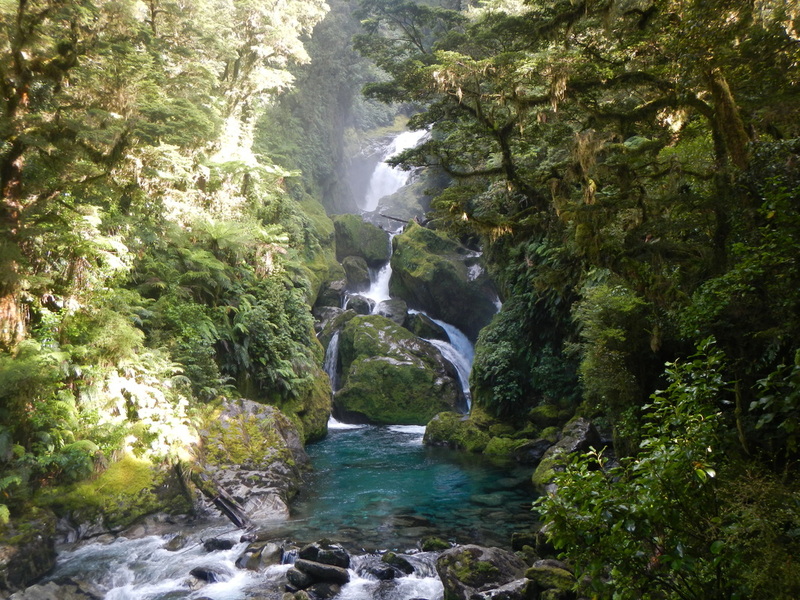 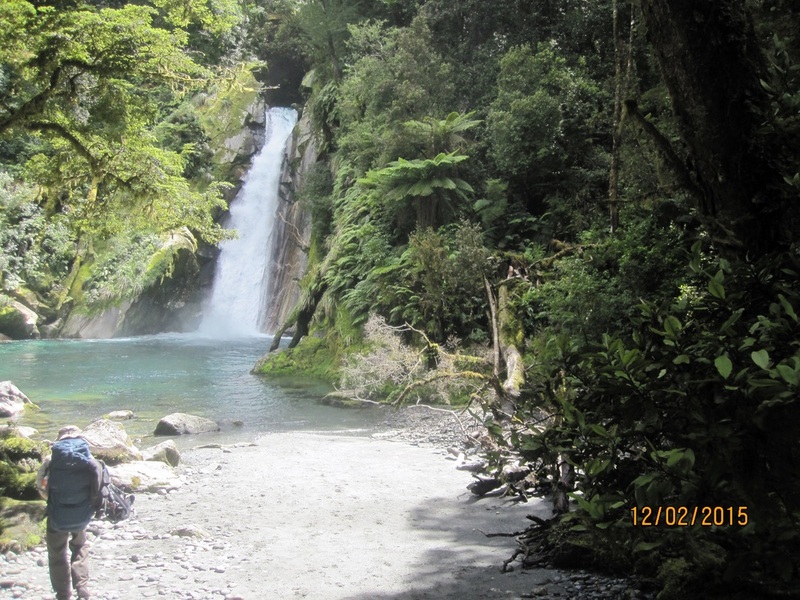 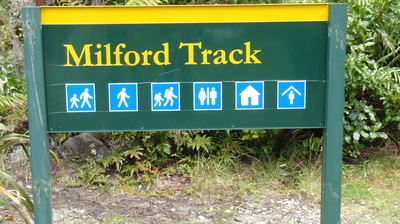 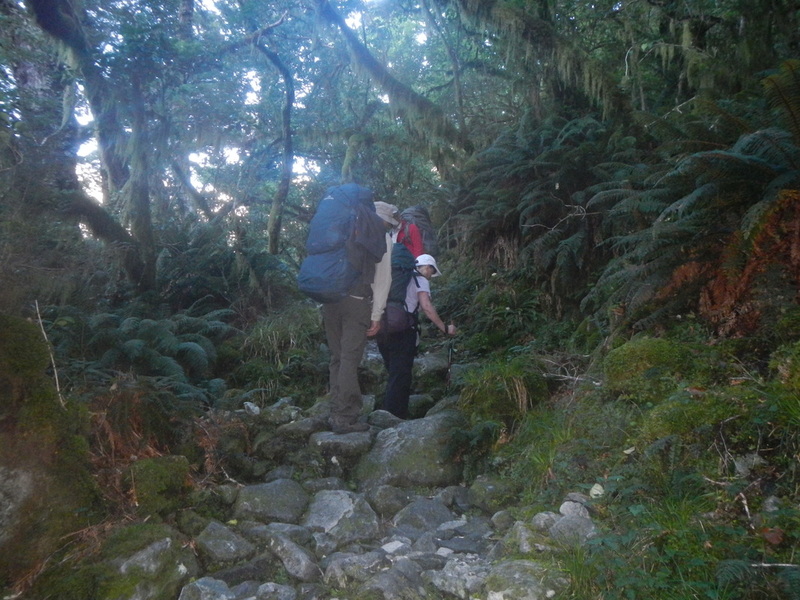 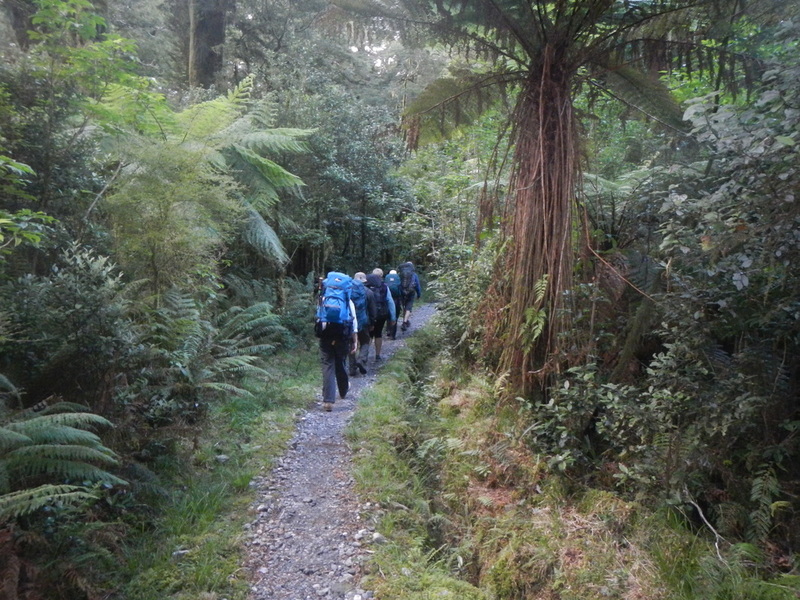 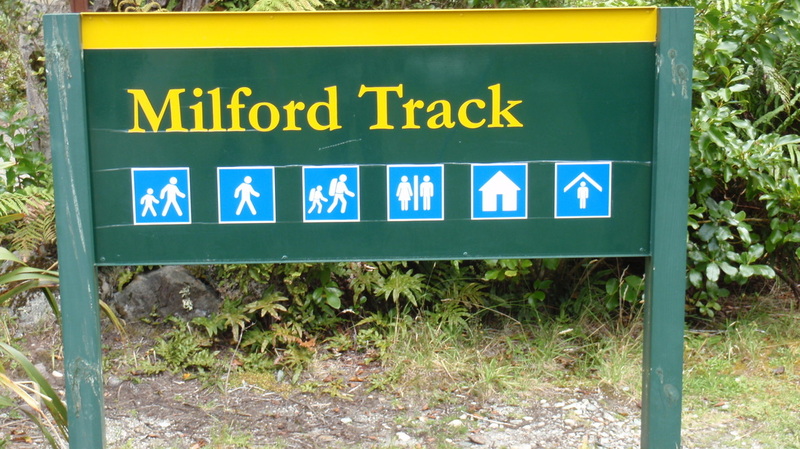 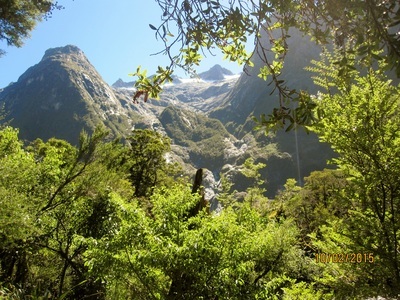 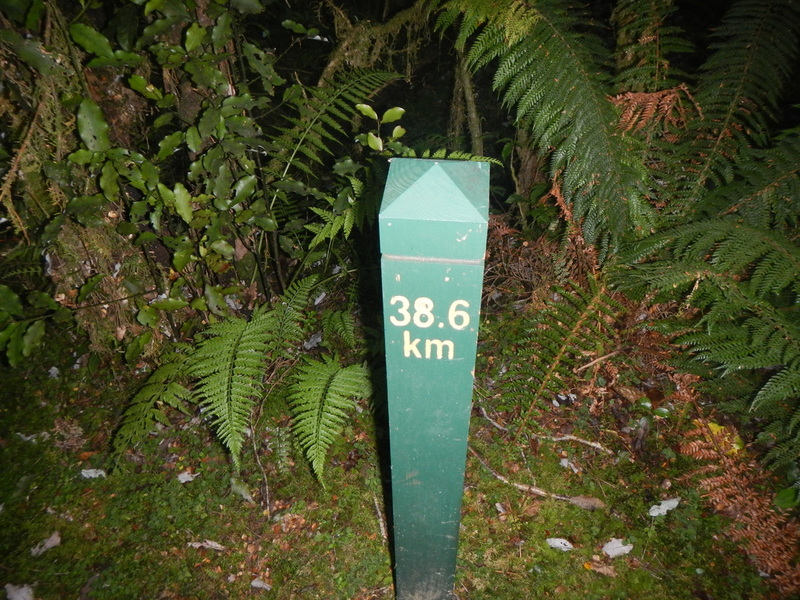 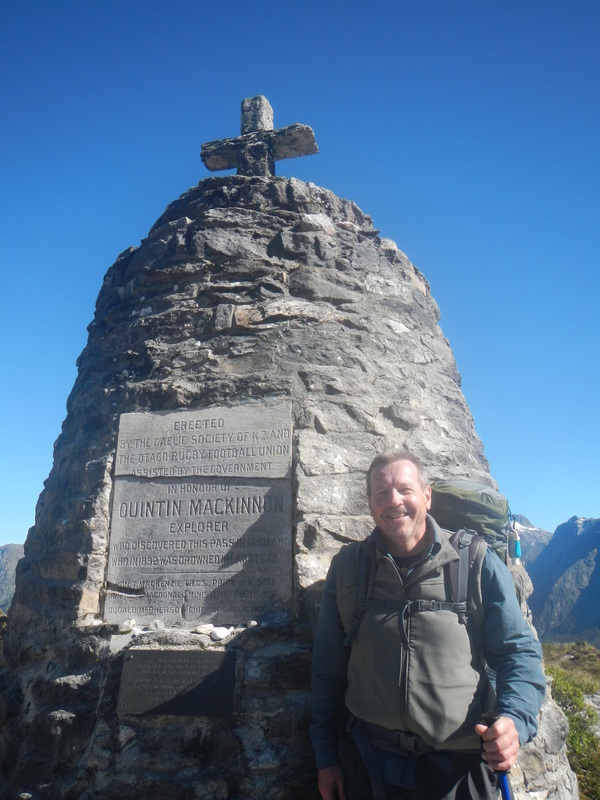 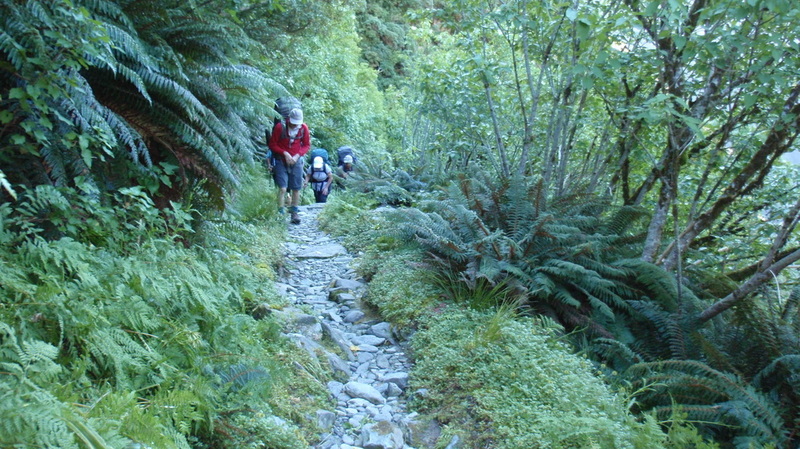 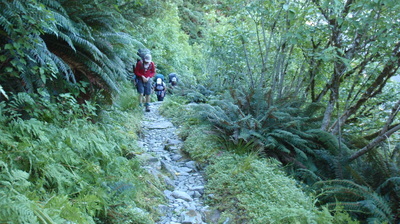 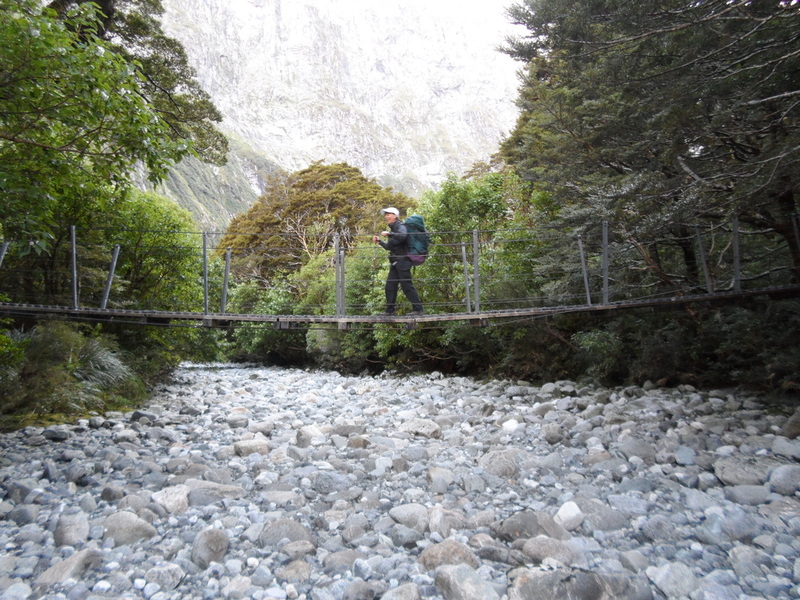 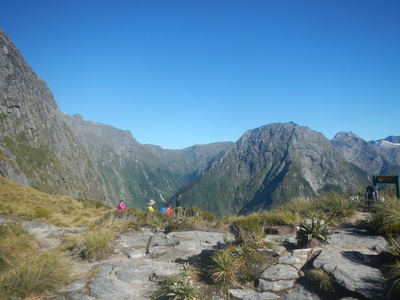 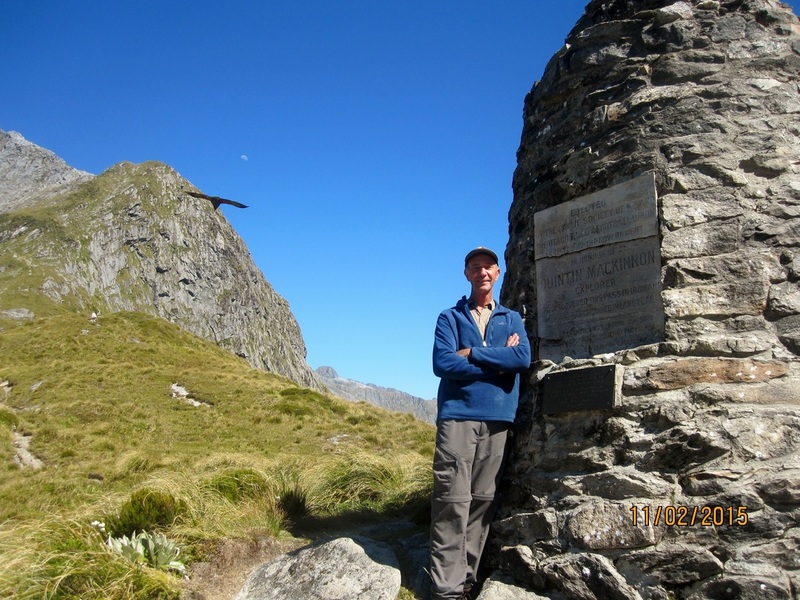 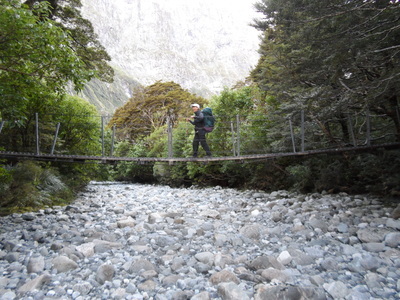 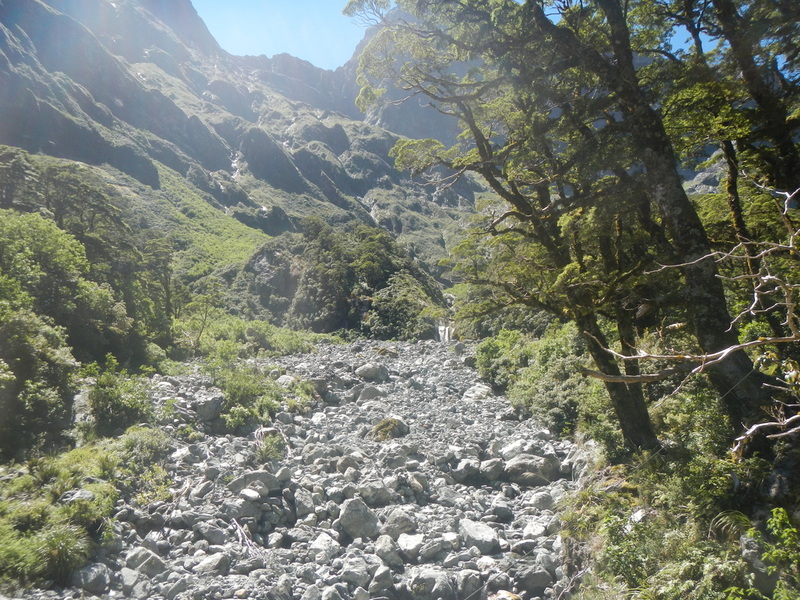 So to all my friends, that was a quick race through the Milford Track. 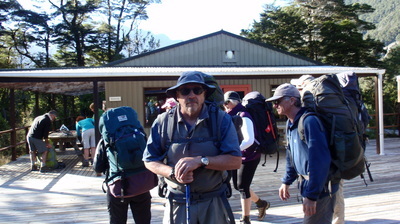 I invite my other walkers to add there photos and comments. 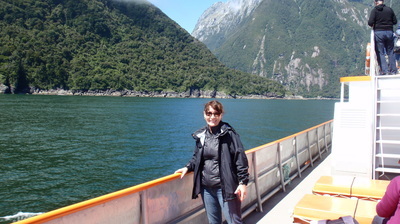 It was a terrific trip and my one sole regret is that Linda Briscoe was not with me. 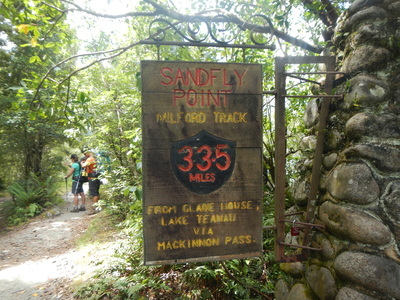 But sand flies like her even more than me. We missed Jo Waldock as well. 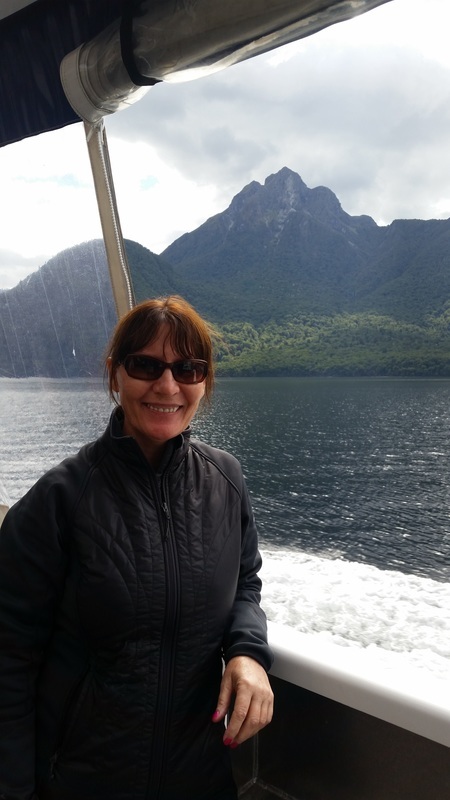 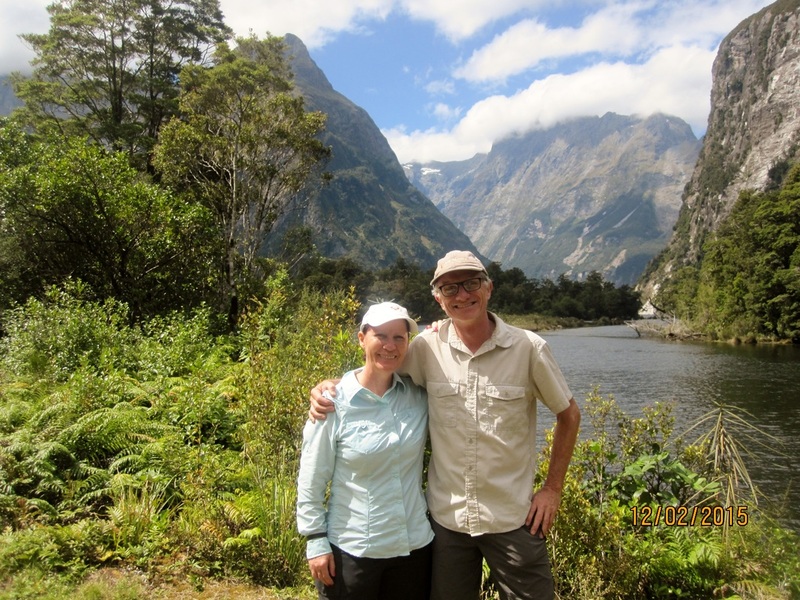 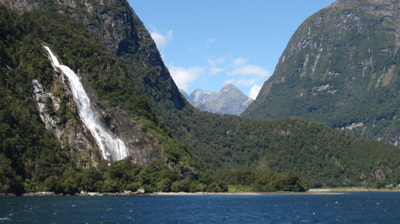 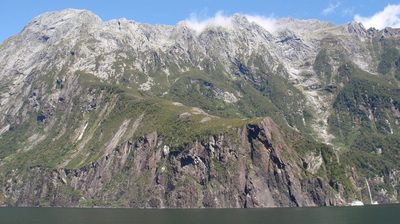 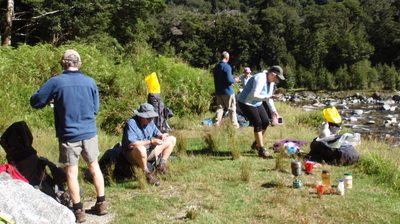 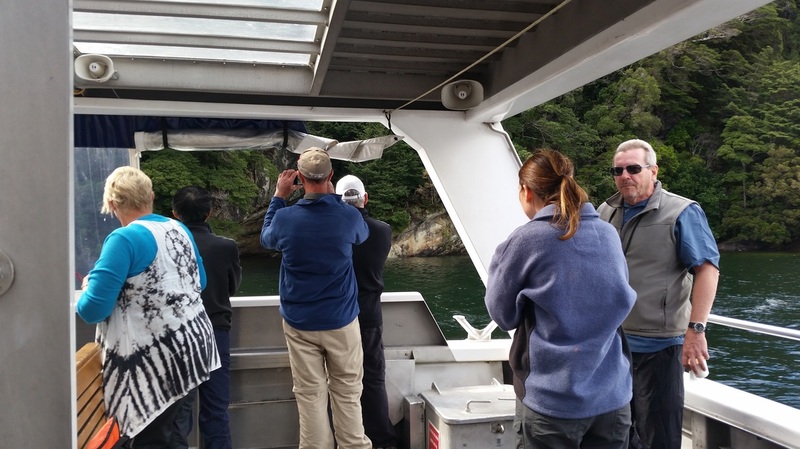 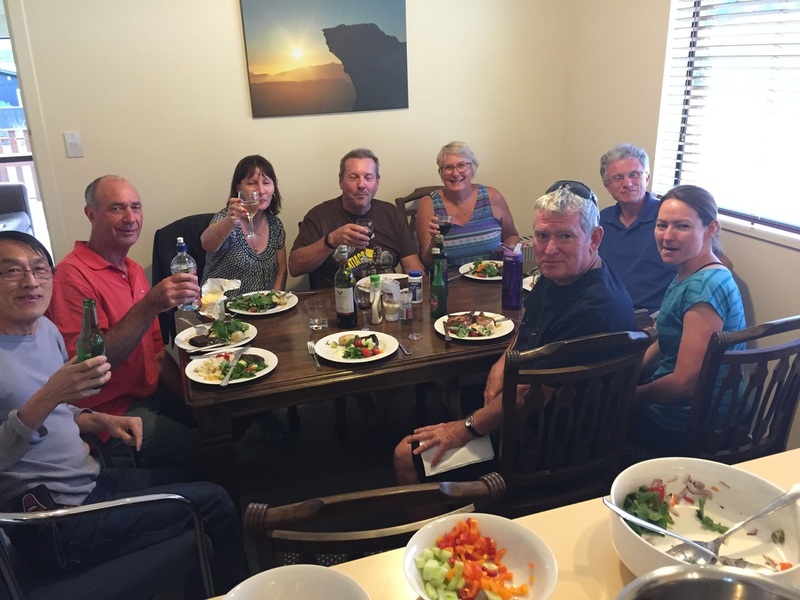 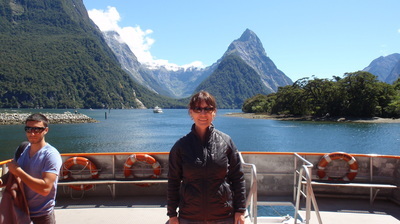 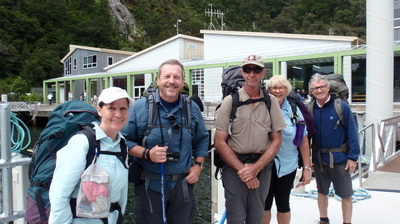 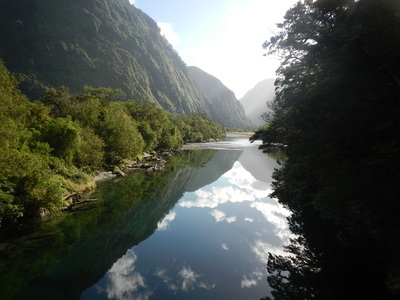 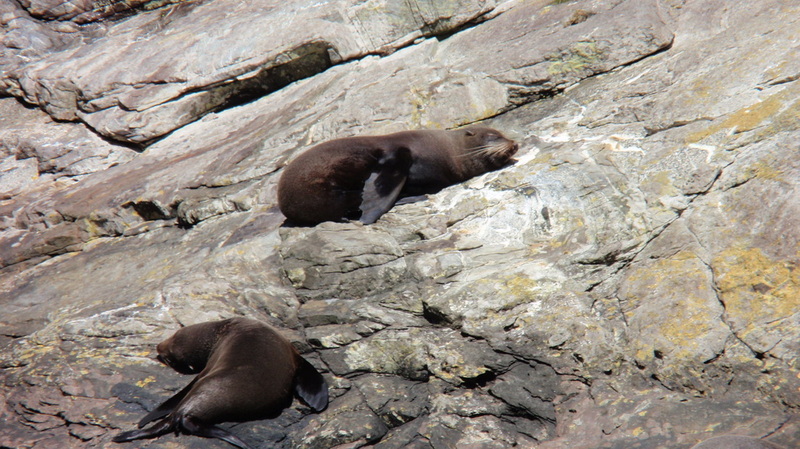 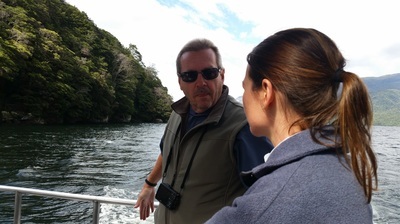 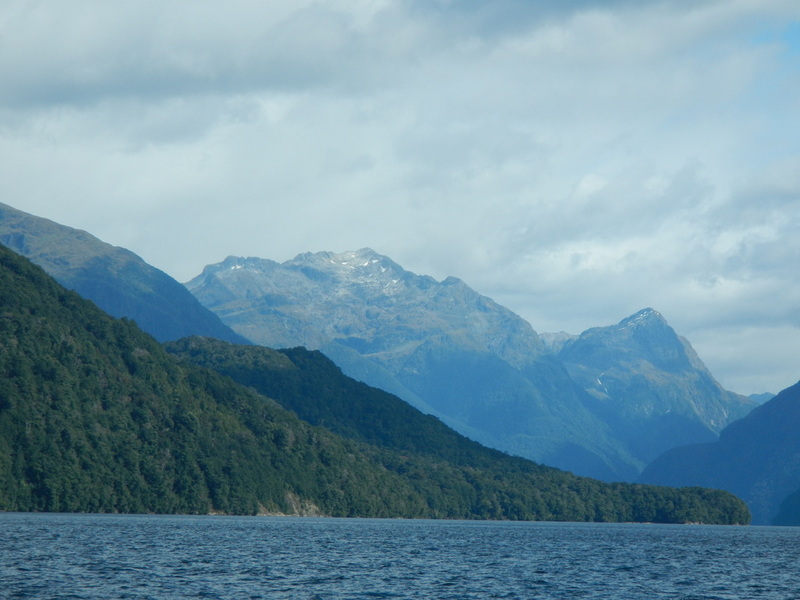 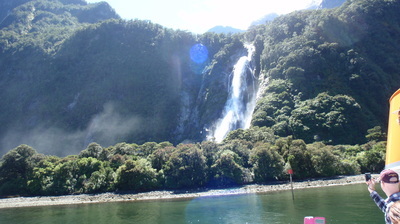 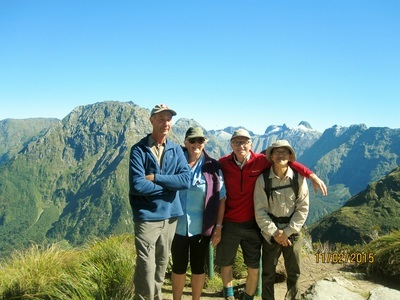 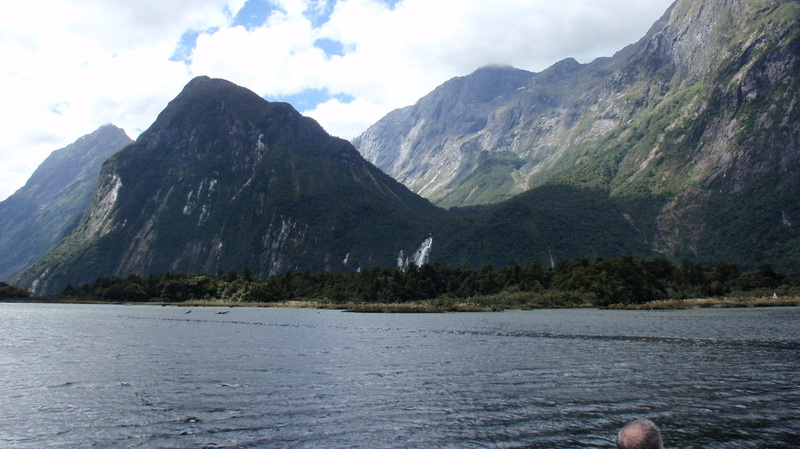 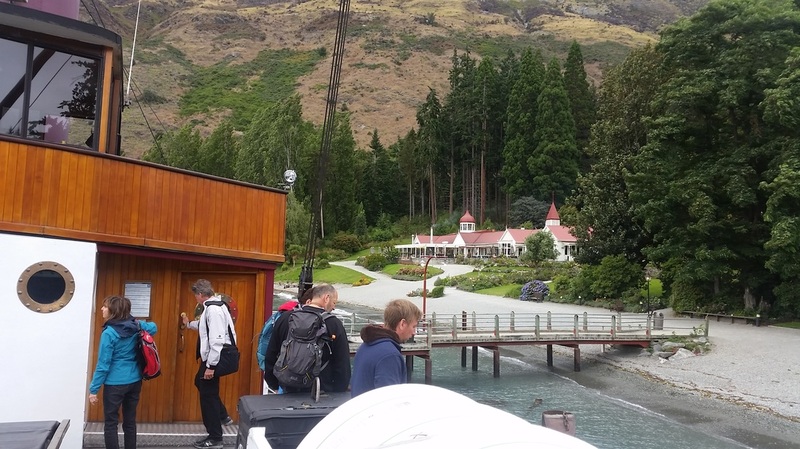 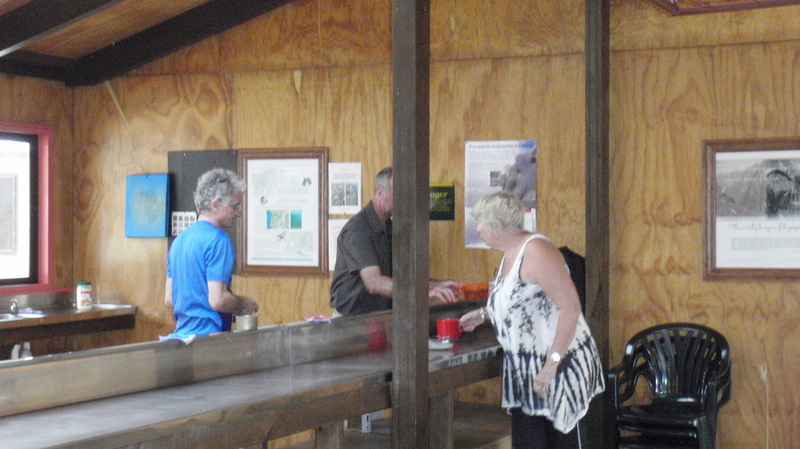 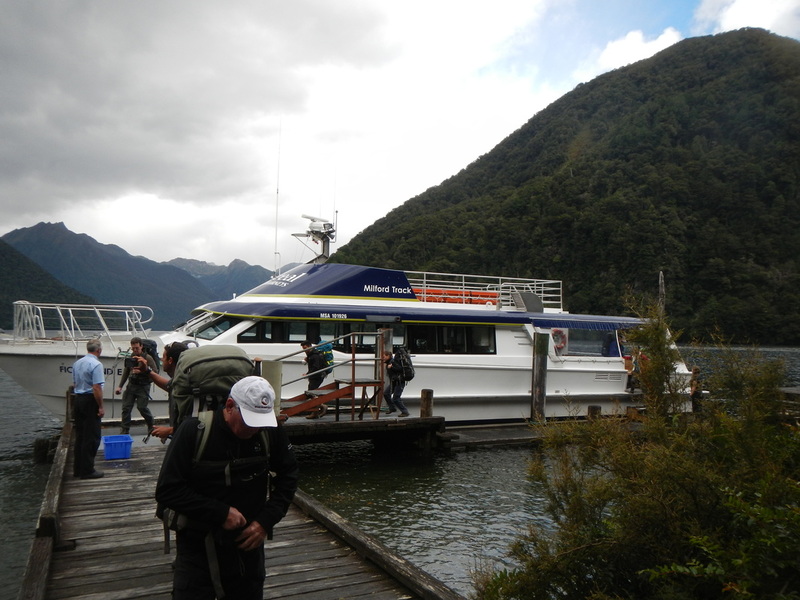 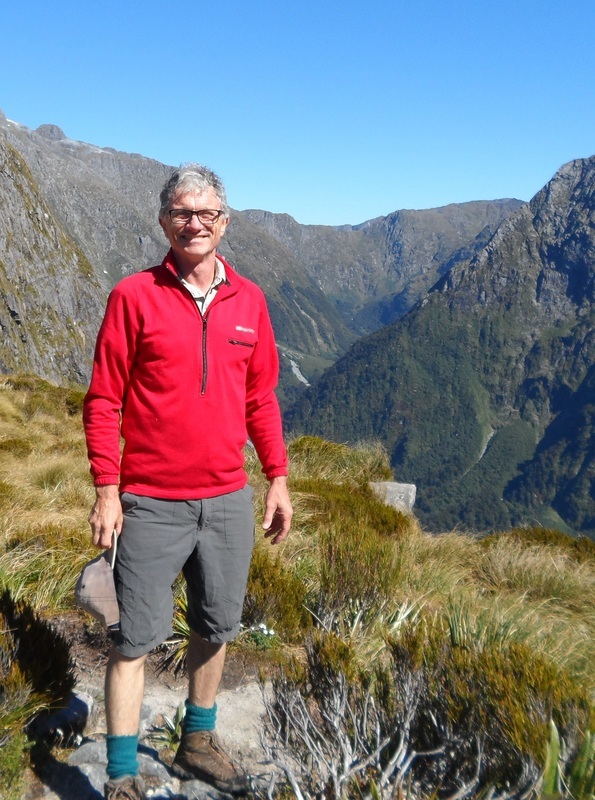 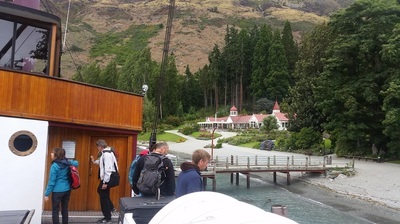 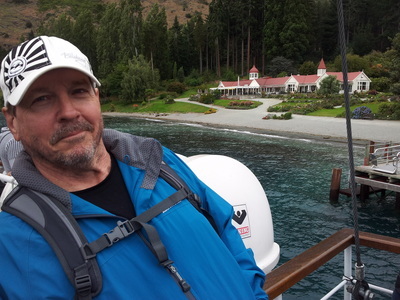 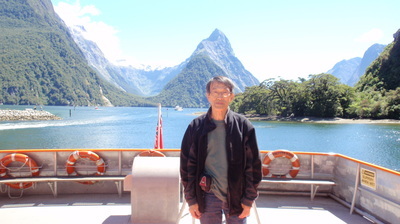 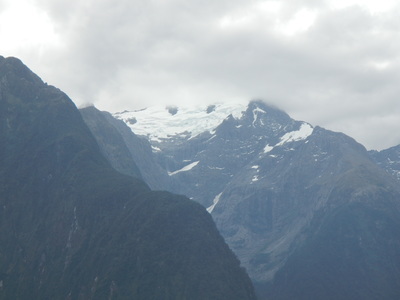 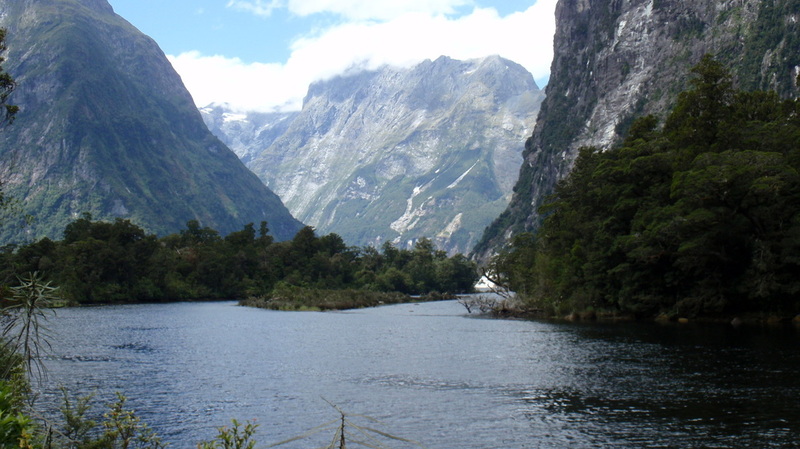 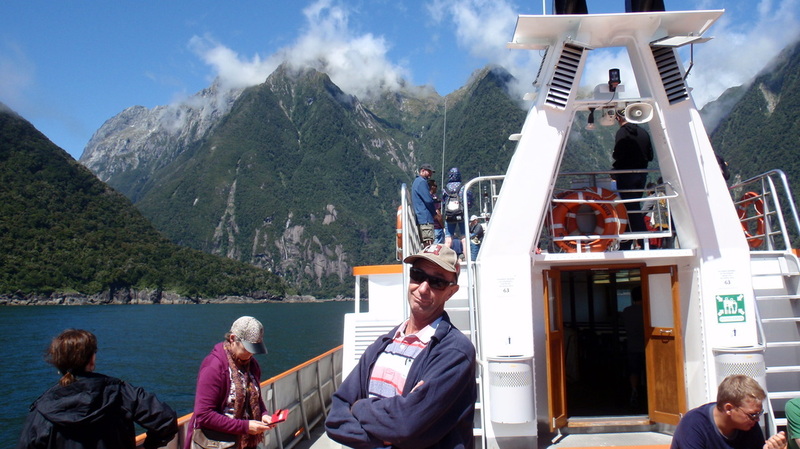 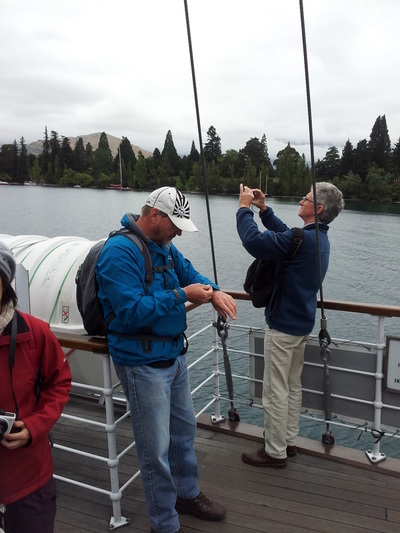 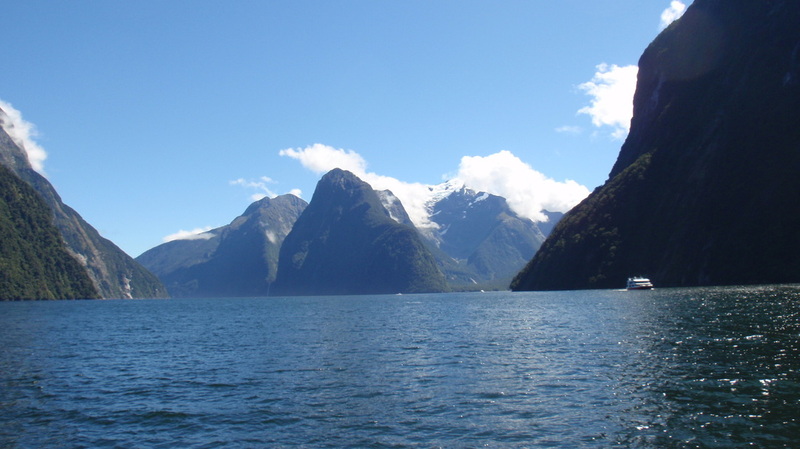 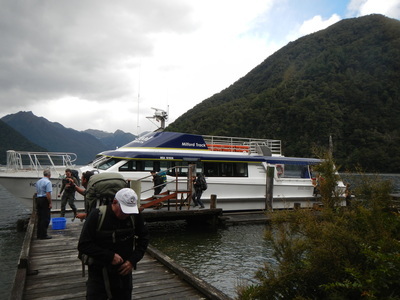 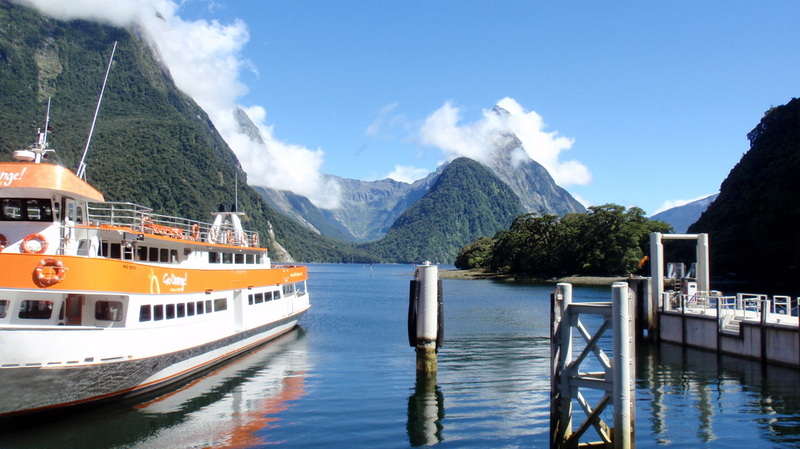 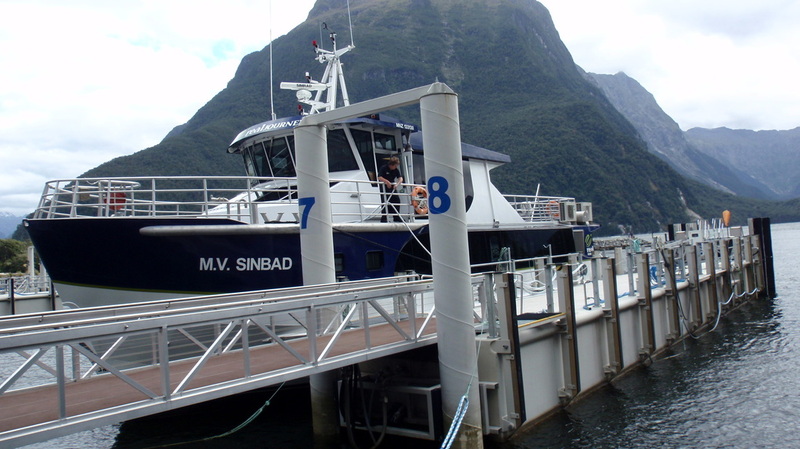 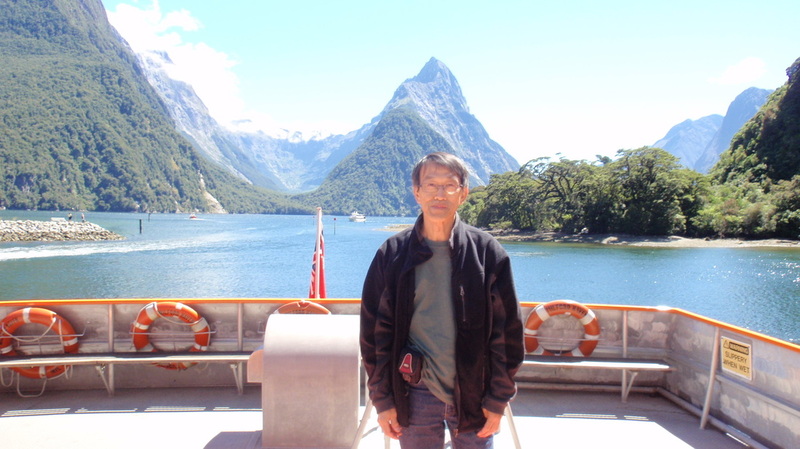 The NZ stayers were doing the cruise on the Milford Sound and would not be back until the next day.